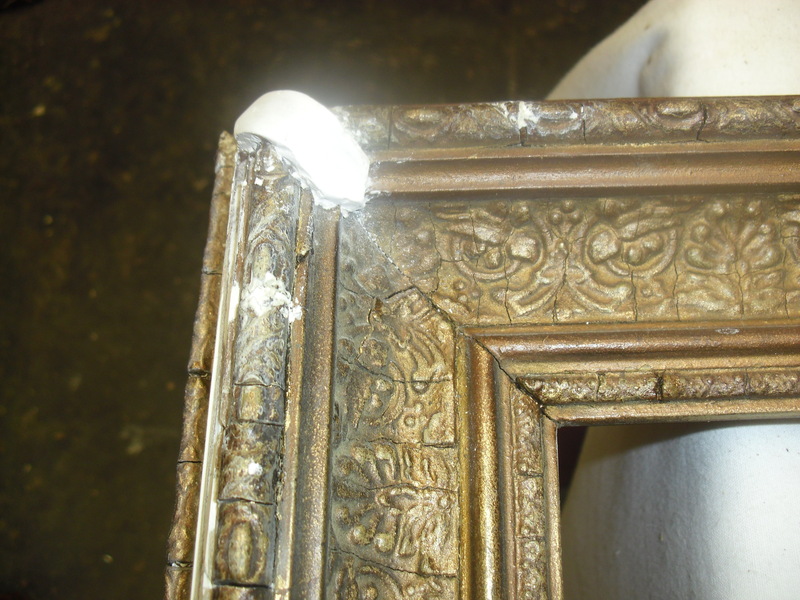 As you can see from the picture below, the mouldings on the top of the frame resemble a roller coaster, due to the frame having got damp in the past. One corner motif and a couple of pieces of moulding were missing. 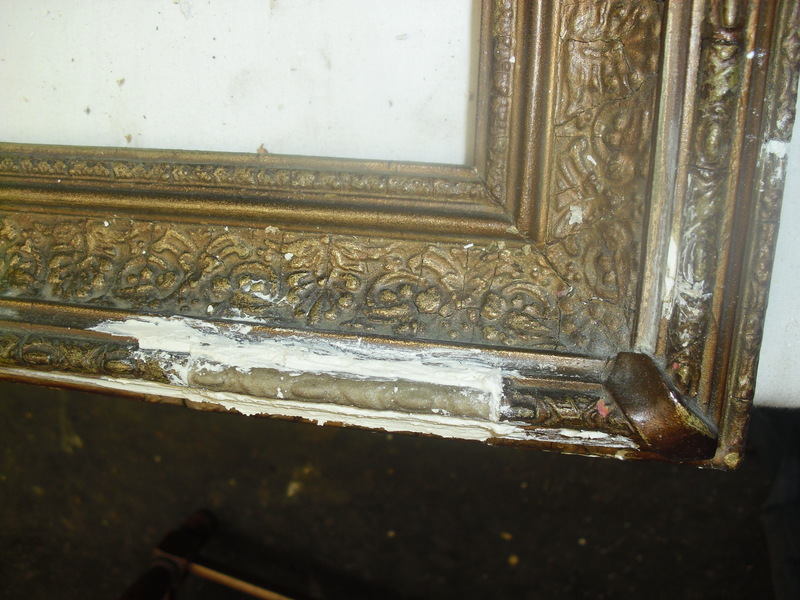 Some pieces were previously glued using contact adhesive (nightmare) and the frame had been brush coated with a green/gold paint. Where the moulding was rocking from being curved I put pressure on each end to snap it, thereby straightening it and gluing it back into position. Once I had a good straight line of moulding, using dentists amalgam I made an impression of the moulding, blocked off both ends with modeling clay and filled with resin mixed with dental plaster. (This gives a harder casting with no air holes). 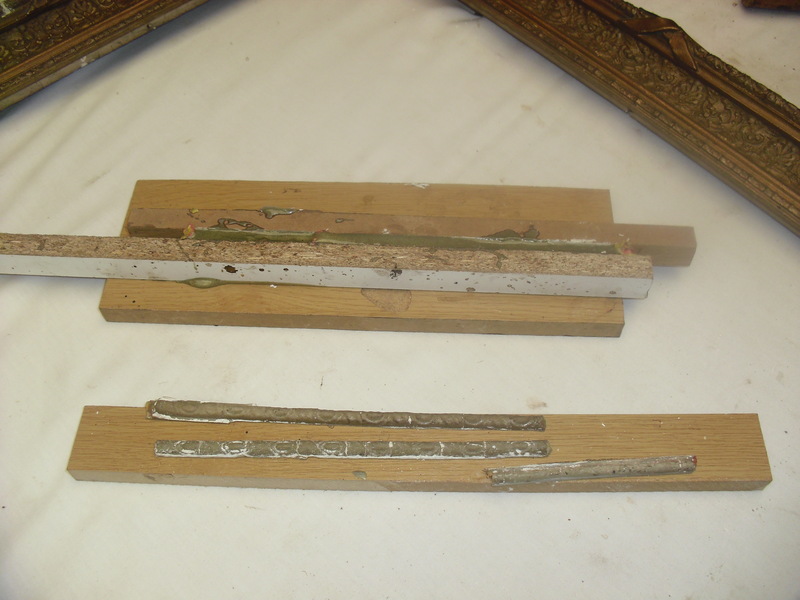 When dry the casing was removed leaving a perfect copy of the moulding. The moulding was then bedded into place in plaster. Left to dry then trimmed to fit and papered with a fine grade Lubrasil. When papering any mouldings or cavettos use an object of the same shape to wrap the paper around (I used a piece of plastic tubing ) as finger papering will just follow the bumps. The missing corner motif was built up using plaster and diluted PVA. When semi dry it was carved to match. 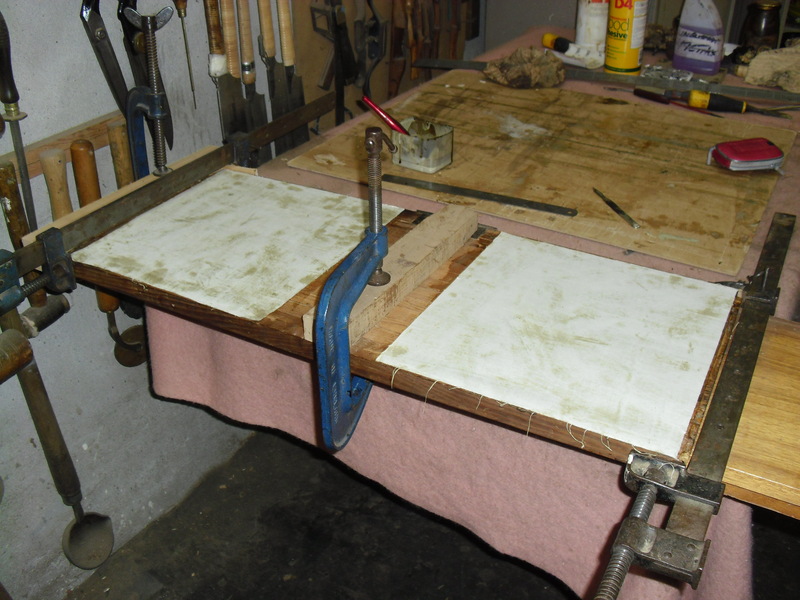 While the plaster was workable I filled as many large gaps as possible between the mouldings and damaged outside edges and corners to the frame. 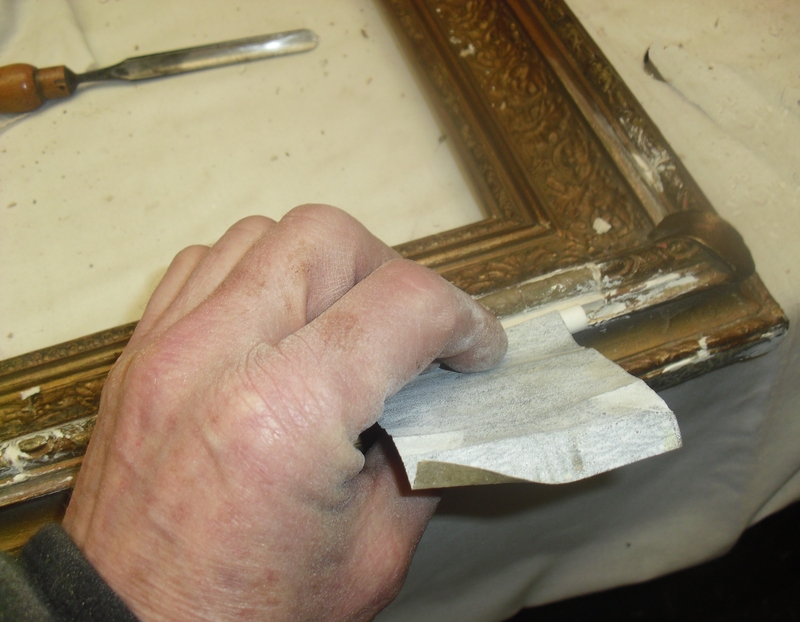 Once all the plaster work had been done I gave the whole frame a wash coat of Antique Gold Finger mixed with shellac polish and a touch of grey umber. 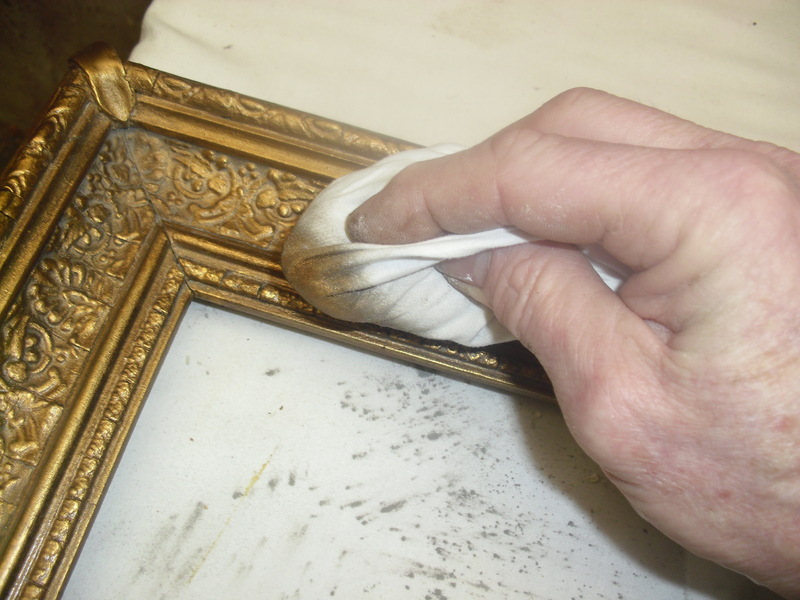 When touch dry I dusted some rotten stone (ground pumice powder) with a paint brush around the frame to give the frame an aged look. 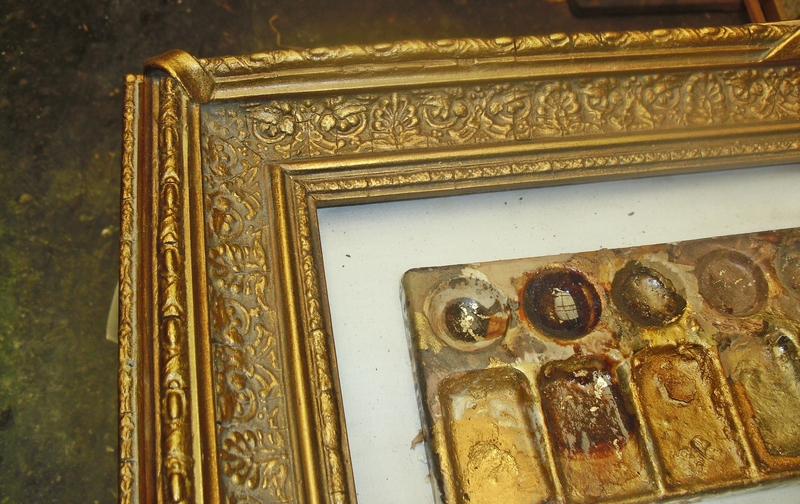 I then made a small dry pad and using Antique Gold Finger I went over the surface lightly highlighting all the high spots, motifs, mouldings etc.leaving the grey rotten stone in all the depressions. 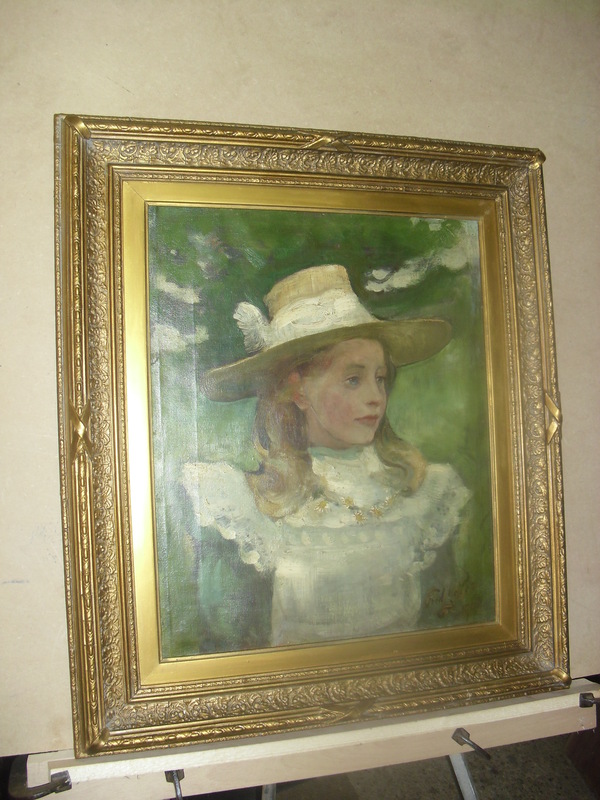 When dry the slip and the painting were pinned back into position and the frame was rewired. 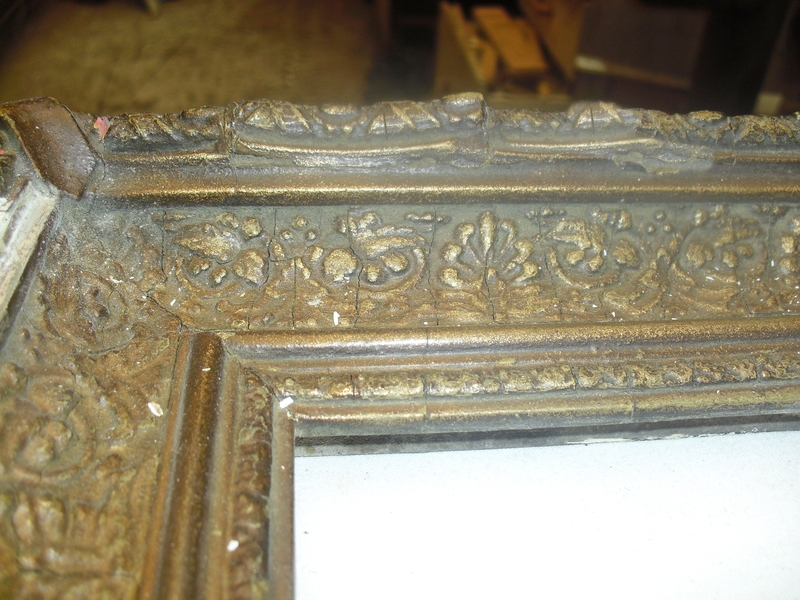 Please note this frame had been previously ‘Painted over’ I would not have used this technique on a gilded frame. I would touch in small spots but would not have gone over the whole frame. 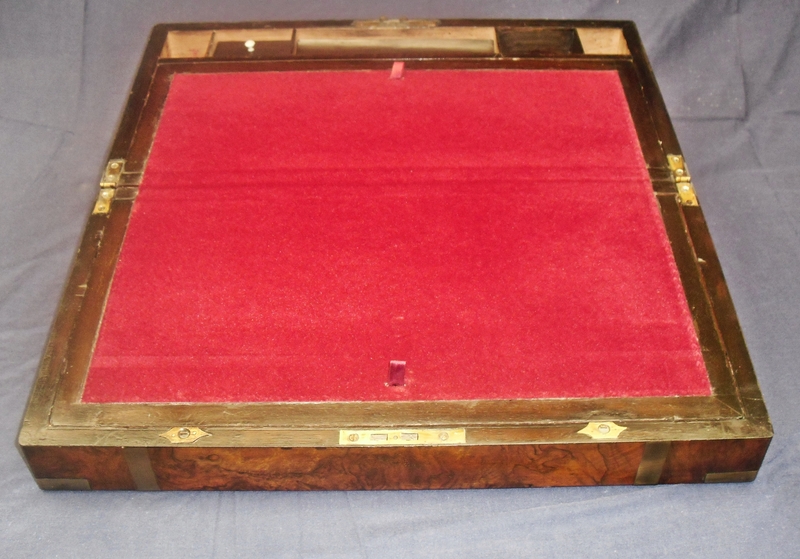 The writing slope has loose and missing brass work and the top is badly scratched. 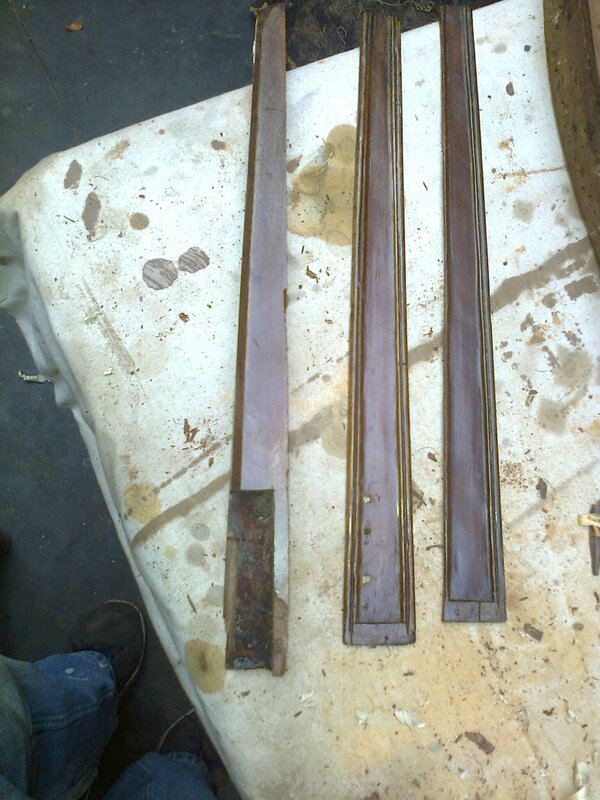 Some brass was cut and filed to size. 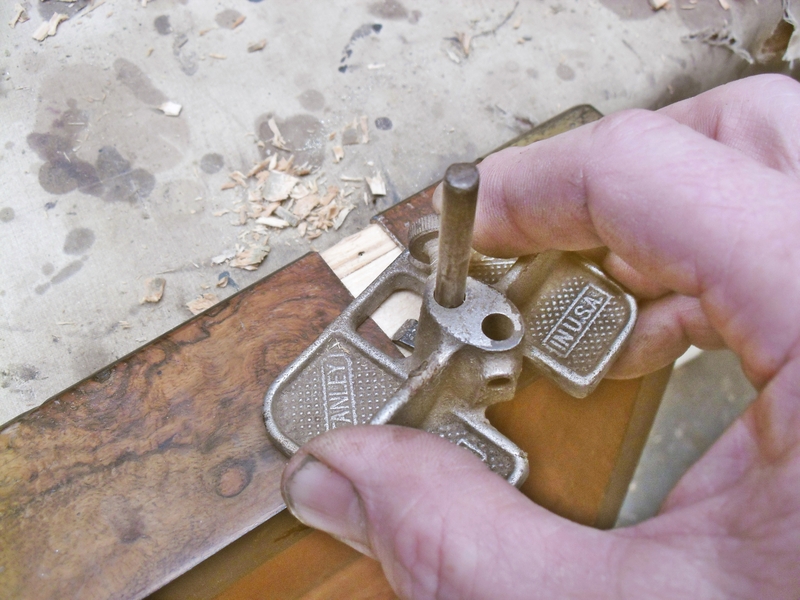 Using an Old Womans Tooth (also known as a router plane) I rebated the groundwork to the thickness of the brass strip. 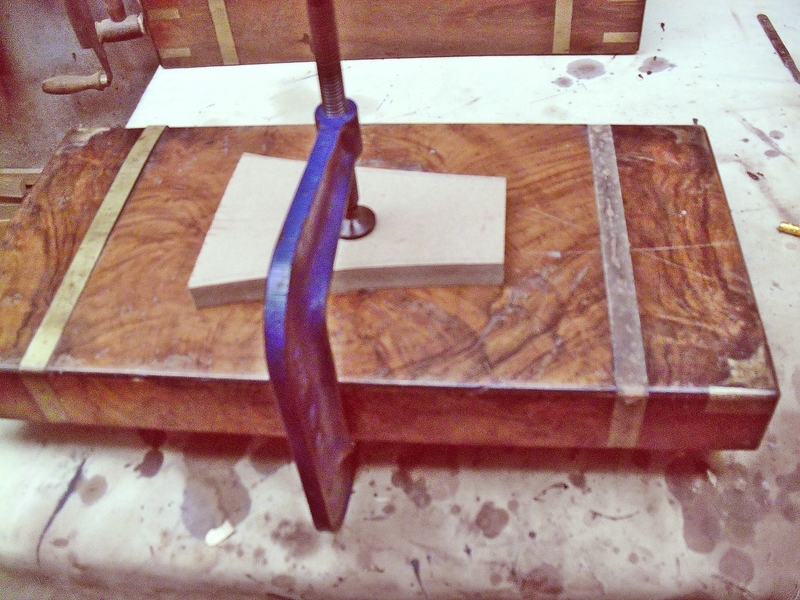 The brass is bent on the corners to the exact width of the top, glued and cramped in place. 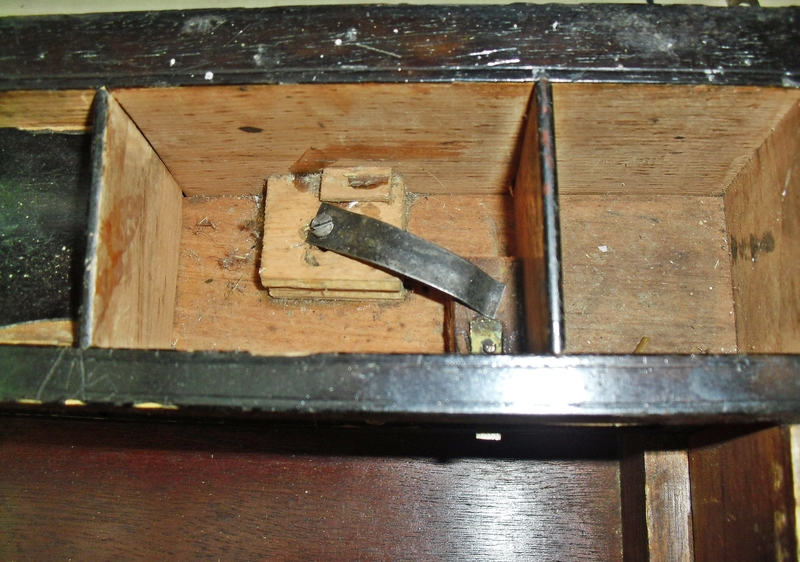 The secret drawer compartment was missing its cover which locks into place over the brass clip on the right hand side. 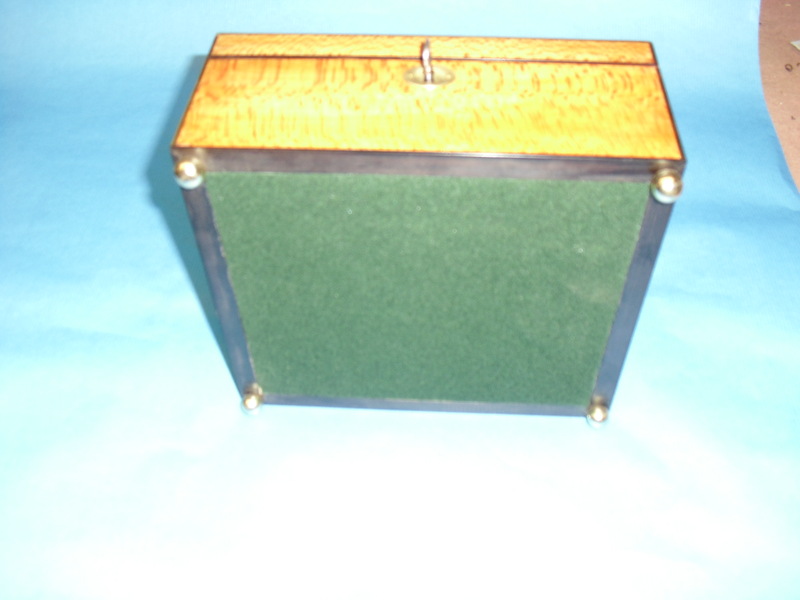 The cover should spring open when the right hand inkwell divider is lifted. 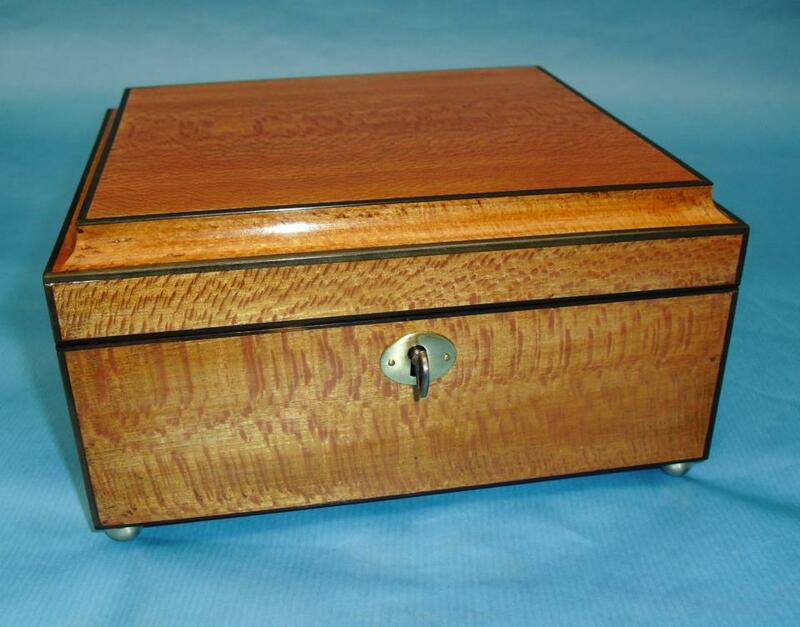 I made a new cover which pushes in over the brass clip and locks in place. The spring pushes it outwards when released. The stamp slide covers up the mechanism. 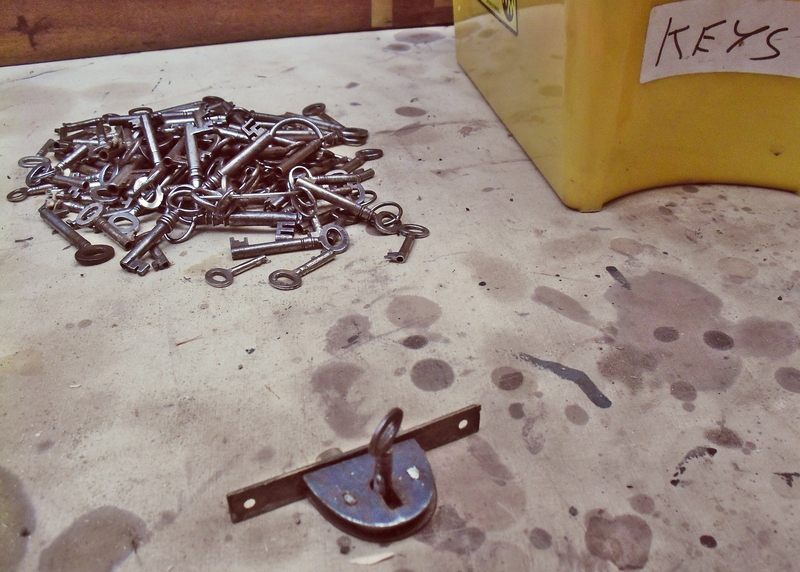 The lock was cleaned, oiled and key fitted. 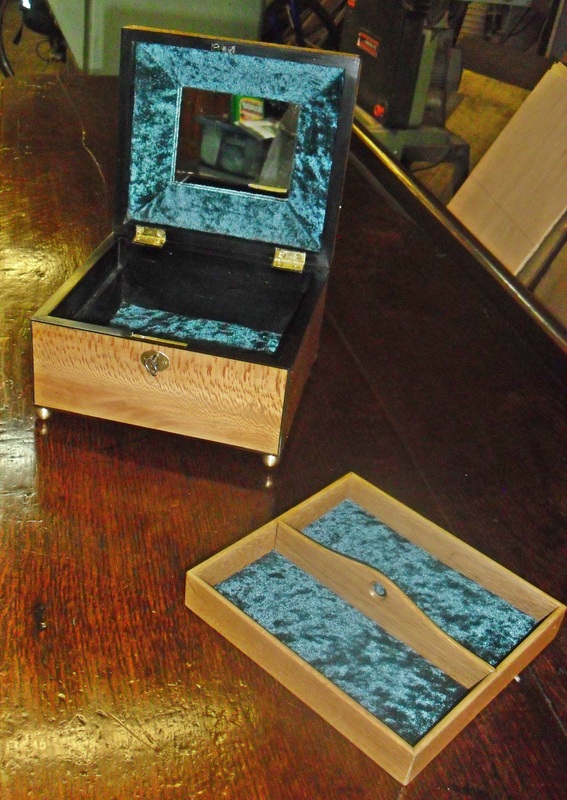 The exterior of the writing slope was then meths stripped and re-polished, the inside touched in, cleaned and waxed. 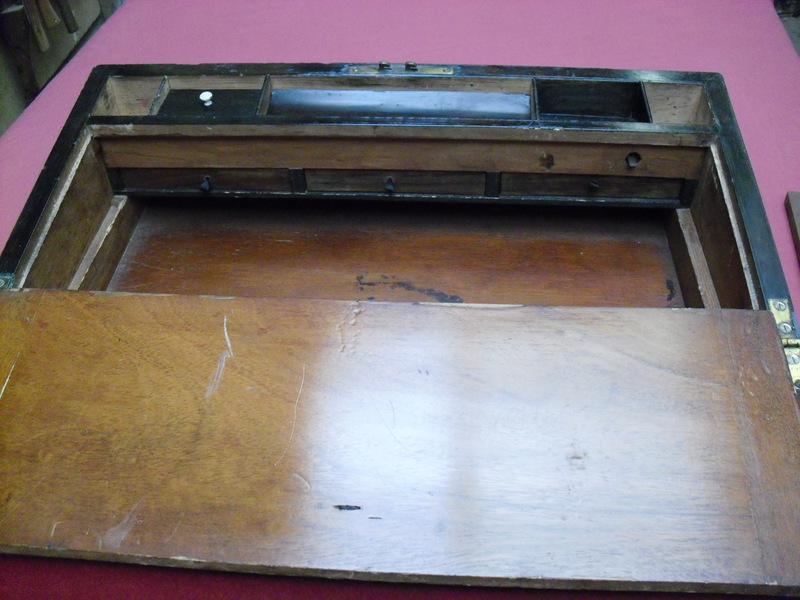 The writing slope was then sanded clean ready for re-lining, which was done in a material as close a match to the original as possible. 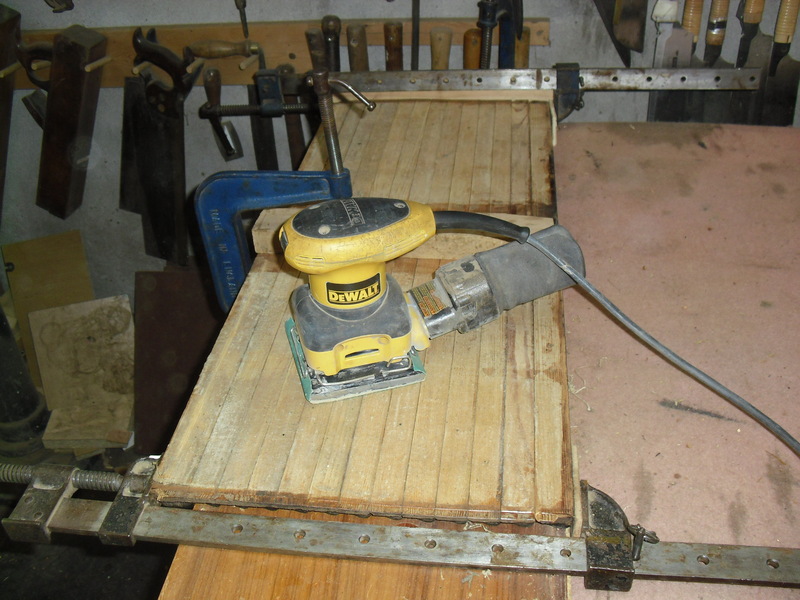 The material was glued into place and cut to fit with a scalpel. 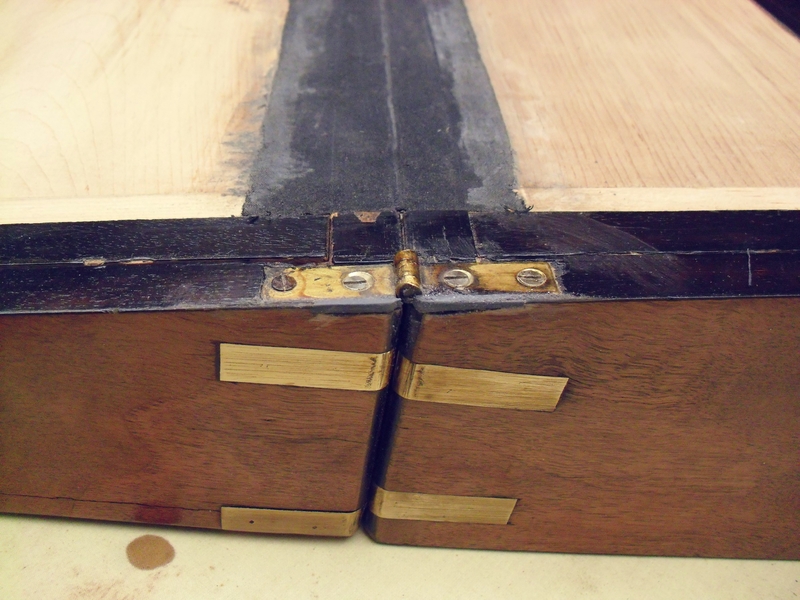 Tabs were then fitted and wedged from the underside. 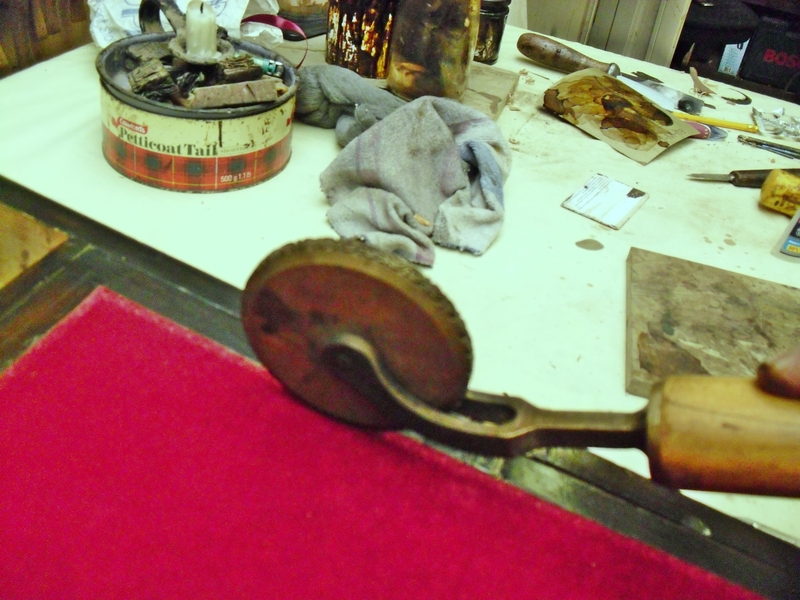 The slope is tooled with a wheel that is heated up and rolled around the outside edge leaving a patterned imprint. The bottom of the slope was then baized. 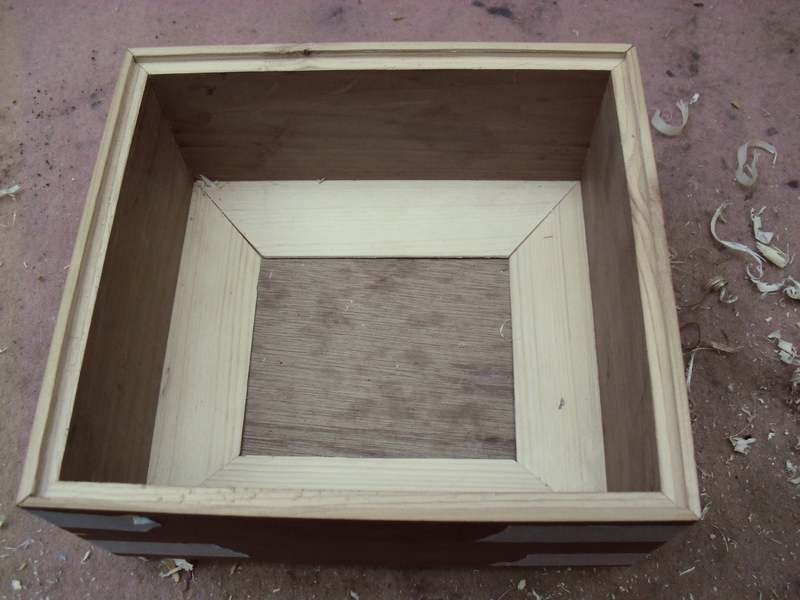 The sides of the box were made from an old reclaimed pine drawer side, this was rebated each side for the top and bottom, then cut to size and the corners were planed to a 45 degree angle, taped together with masking tape, ready for gluing. 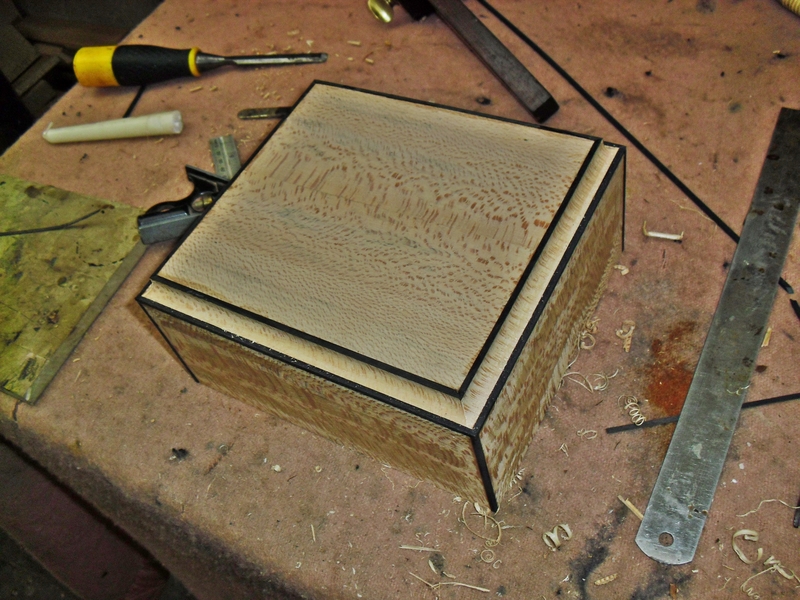 The top was built up and mitered for the caveto mold around the top edge. When dry the caveto was routered out. 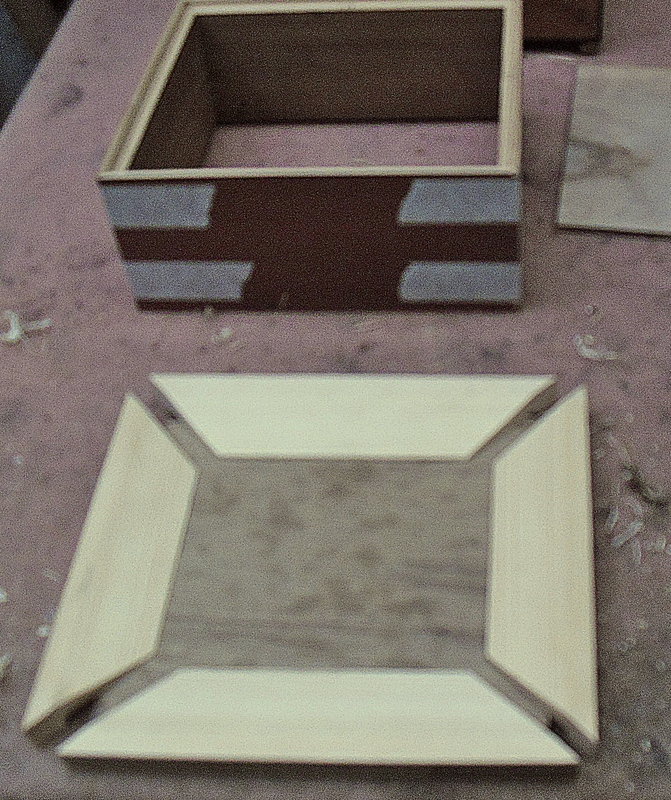 The corners were cut with a hacksaw blade and reinforced by gluing in pieces of veneers as you can see below. 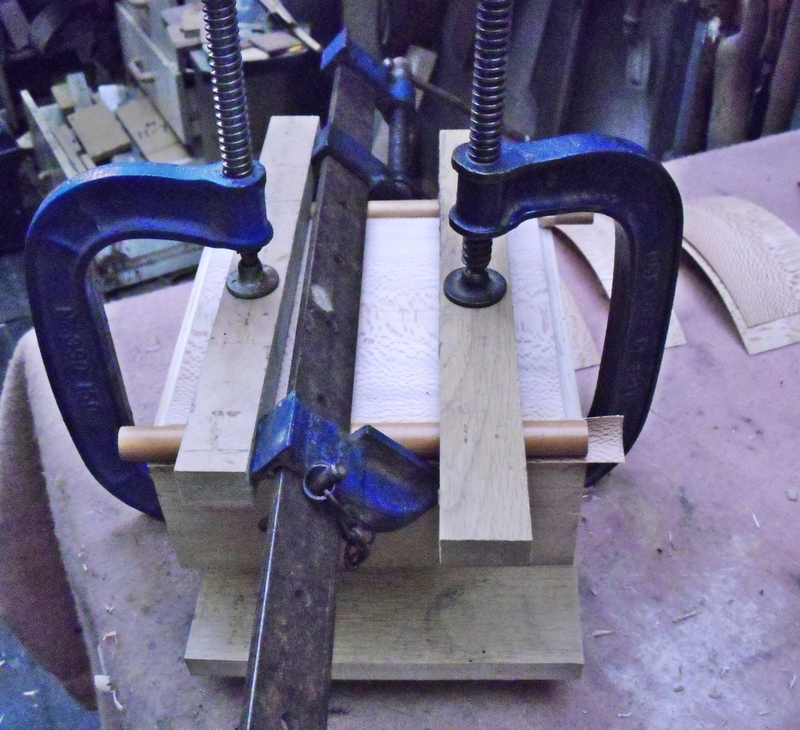 Cramping the veneers to the cavato molding. Trimming the veneers and marking out with a cutting gauge for ebony stringing. Cutting the corners away with a scalpel. Cutting the lid. 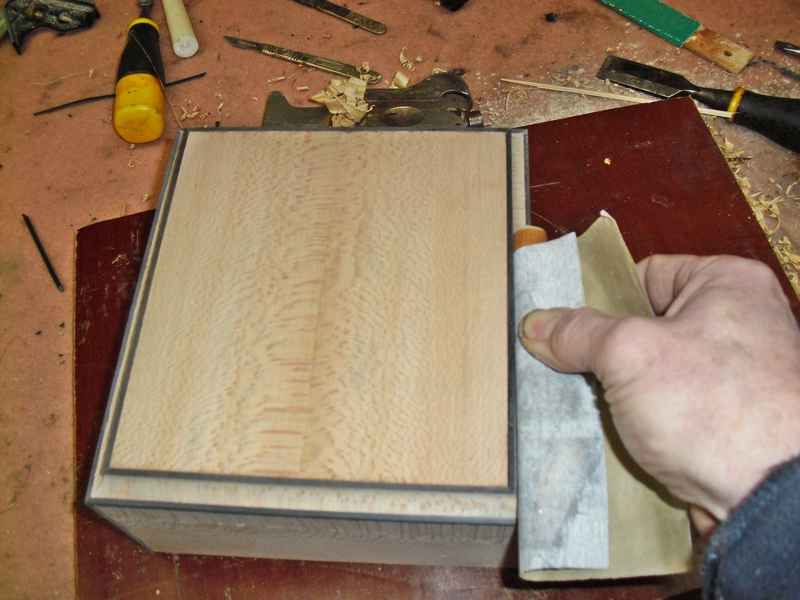 Before I cut the lid I went around with a cutting gauge twice so that the saw wouldn’t rip the veneers off. 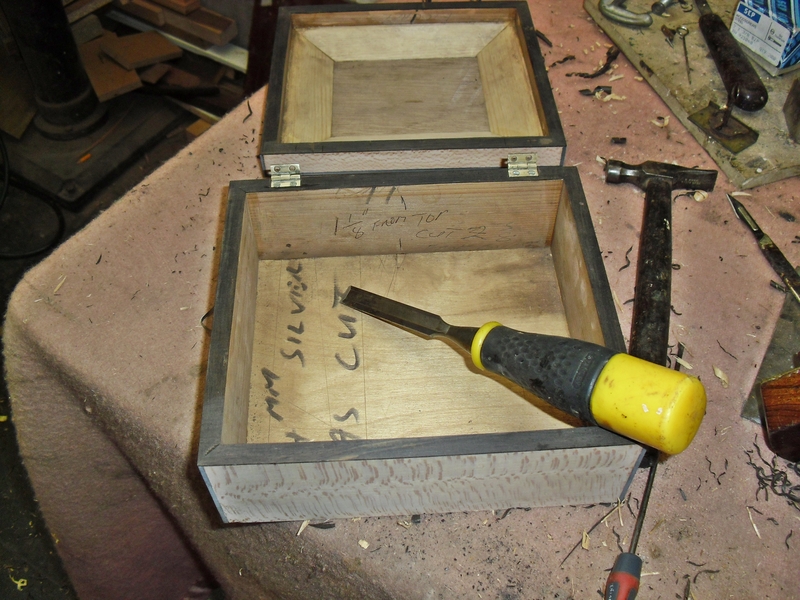 Fitting the ebony strips to all edges of the box. 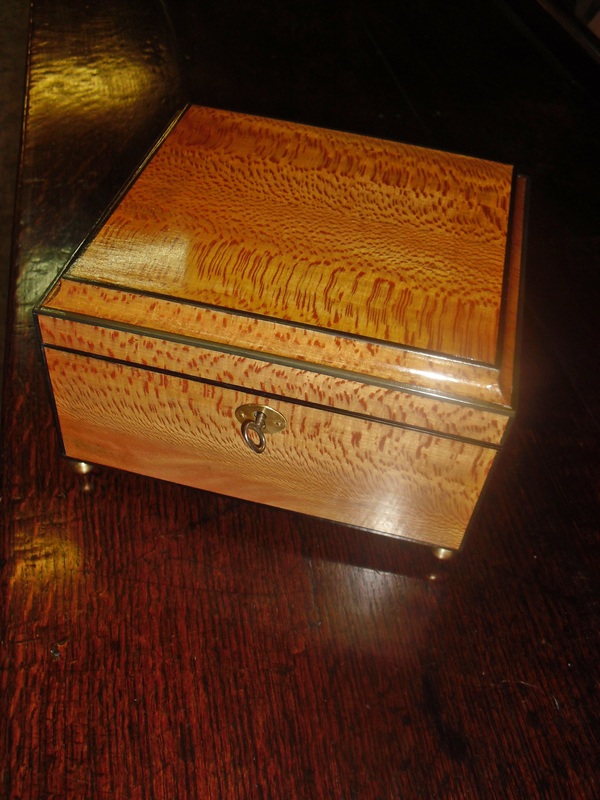 Fitting the hinges and lock which were reclaimed from an 18th century tea caddy. 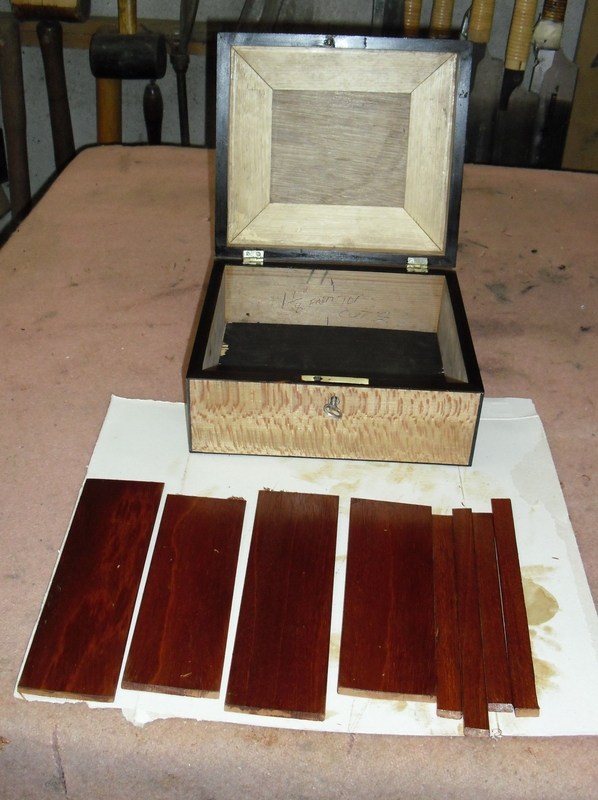 Some thin strips of mahogany from a reclaimed drawer bottom, were cut and polished to fit the interior. 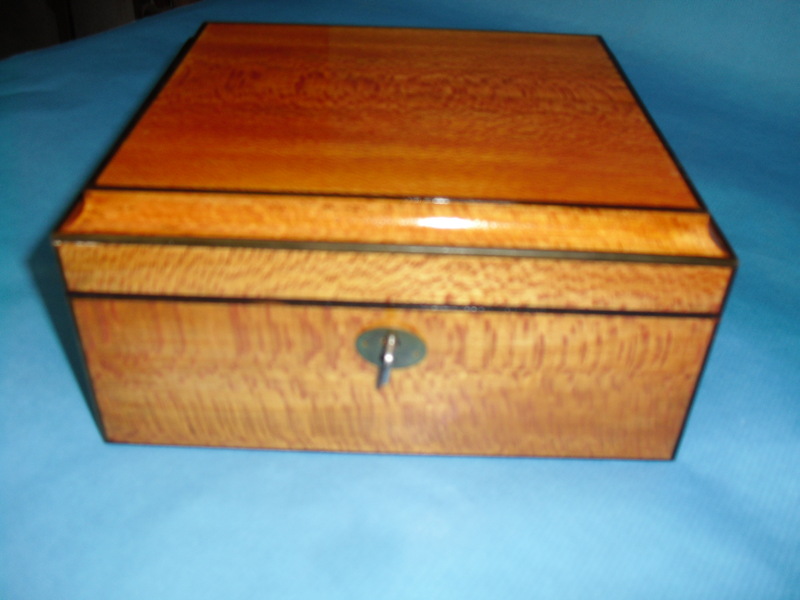 The box was then french polished waxed and escutcheon fitted. 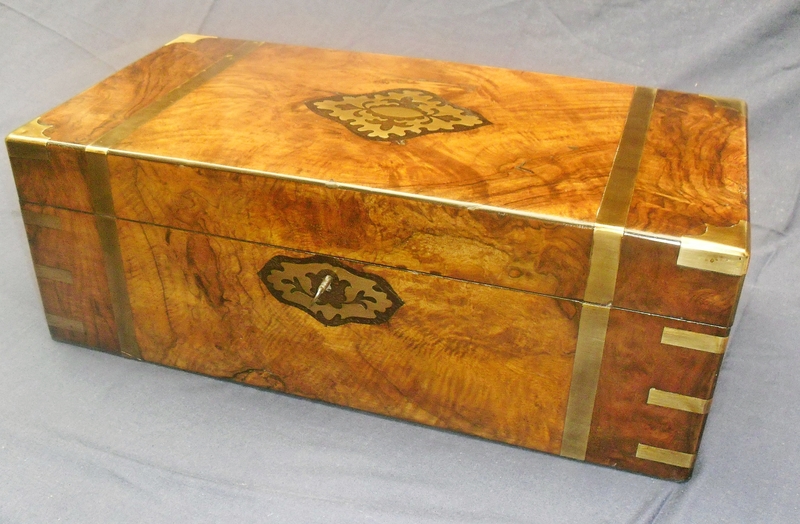 A crushed velvet material was used to line the inside of the lid and base and the mahogany side panels were fitted. 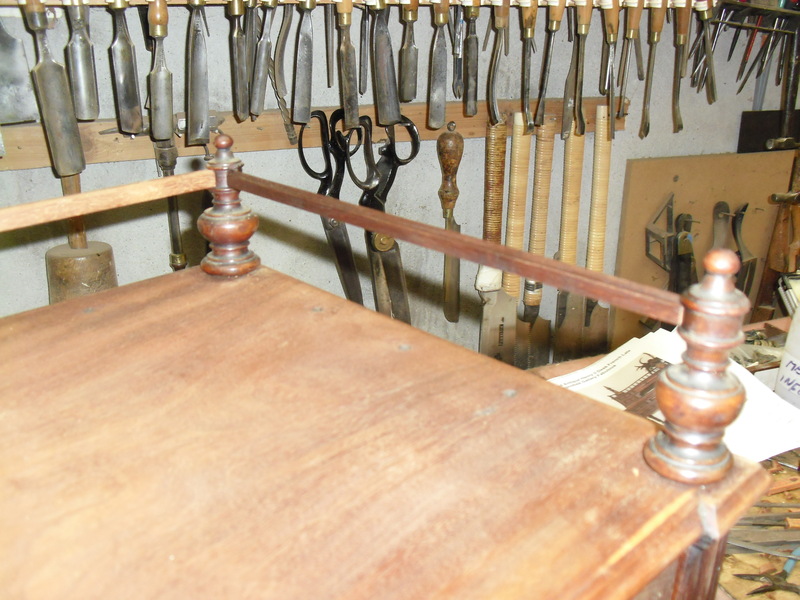 Brass ball feet were screwed to the base and the bottom lined with baize. 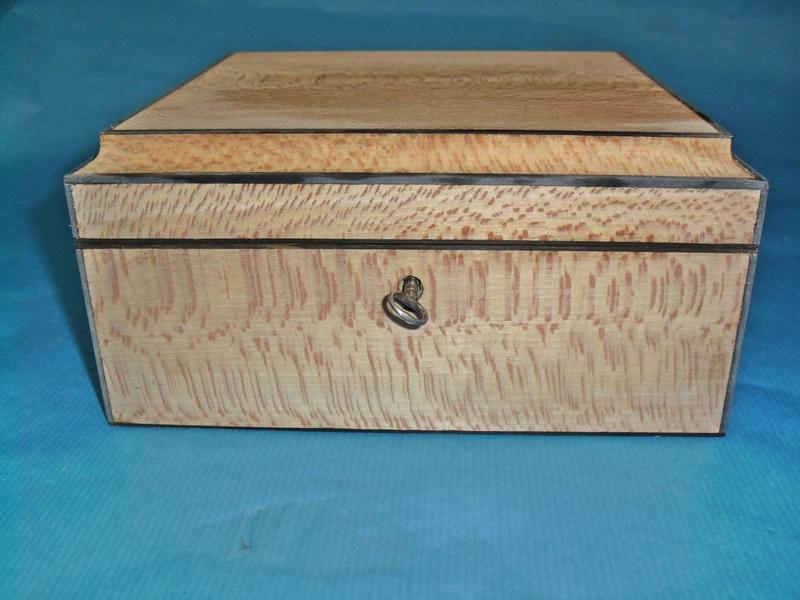 Since making this I have made a box for another of my sisters Christine, to celebrate her ‘Big Birthday’. 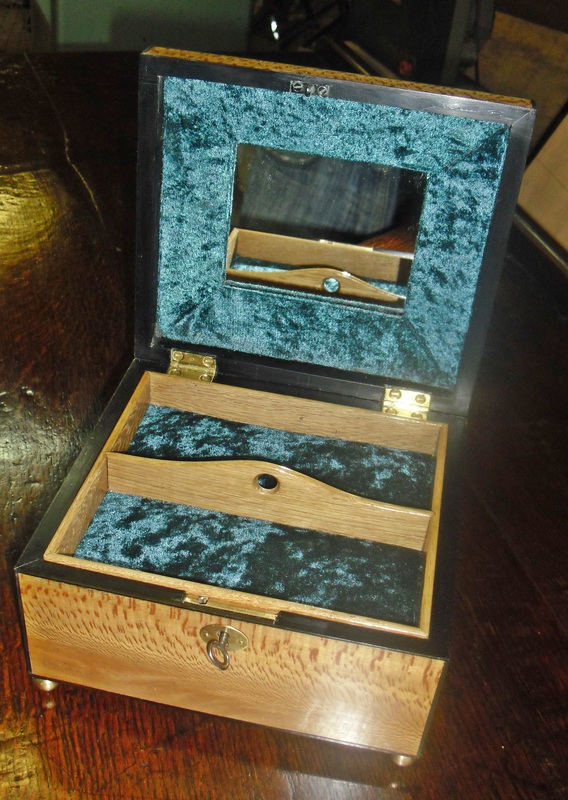 This one was slightly deeper and incorporated a removable inner tray. 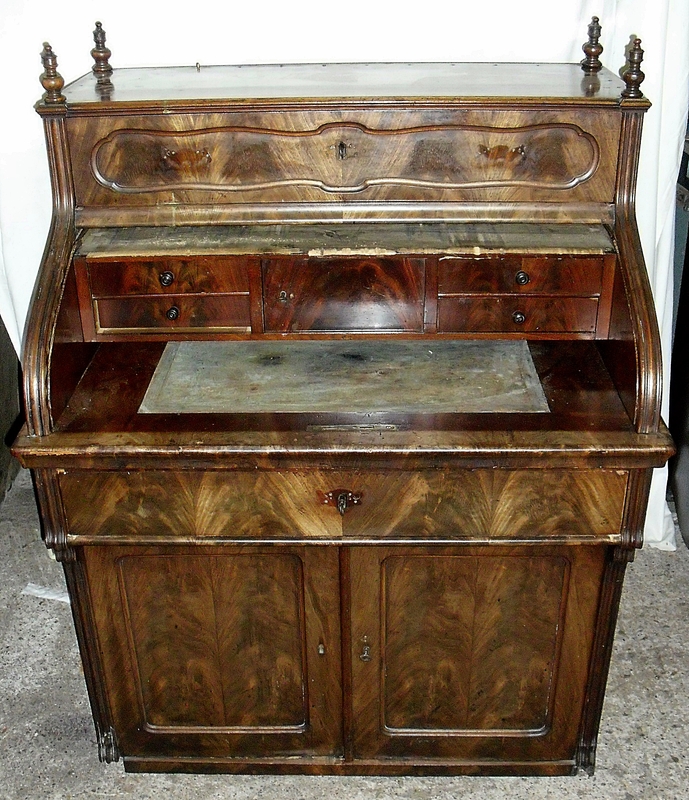 This Biedermeier desk came into the workshop for restoration. 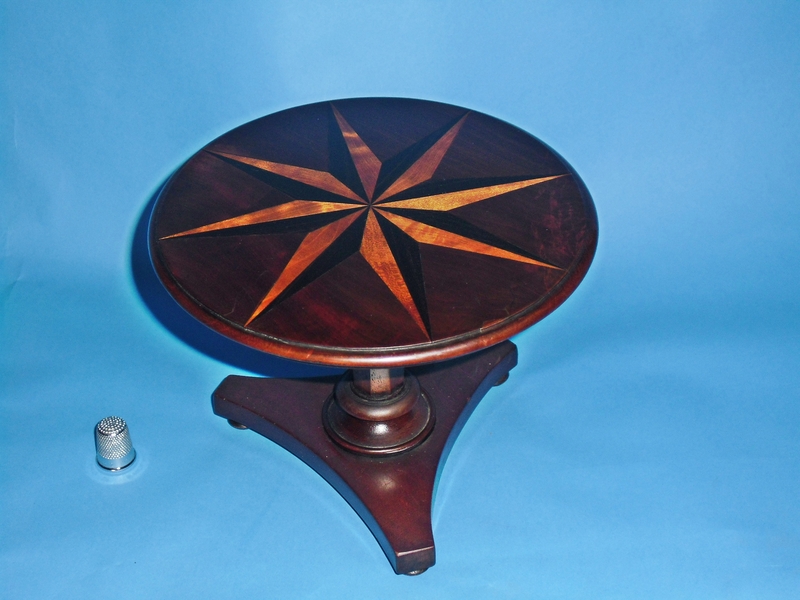 The tambour needed relining, the feet were missing and there was damage to the left hand side of the plinth. 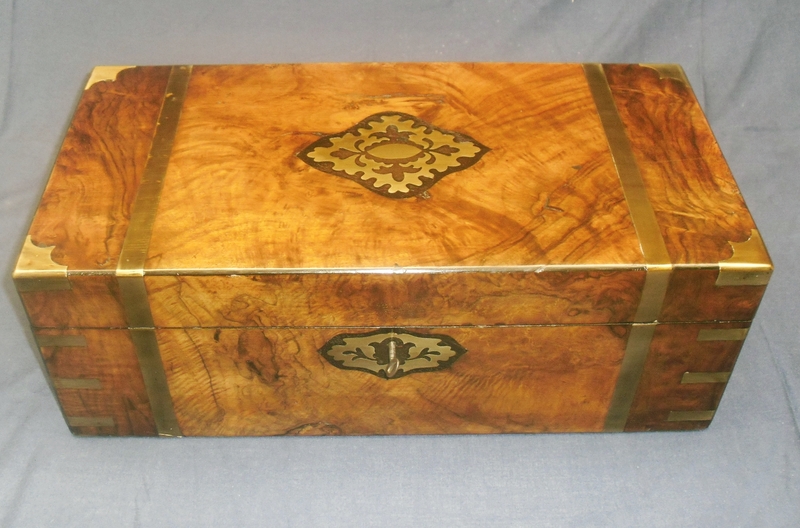 There was some patching needed to the veneers and a new leather was required. 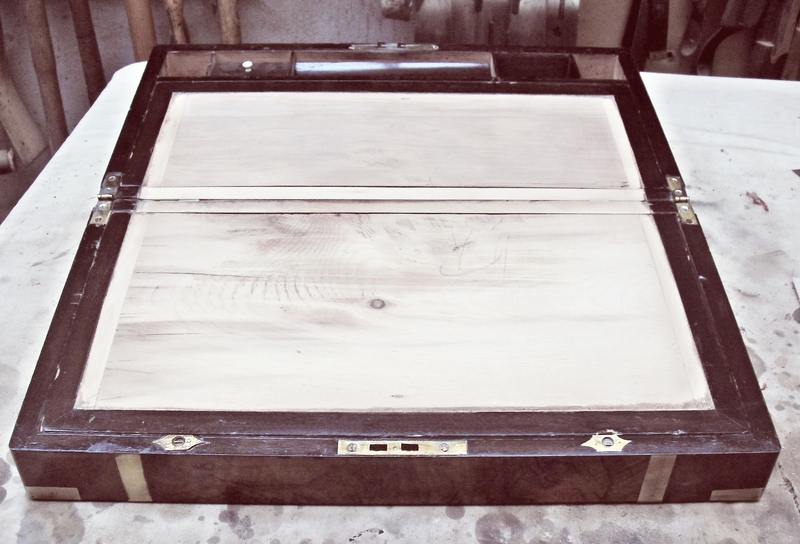 The finish to the desk was badly faded and stained in places. After discussion with the client we decided what shape the missing feet should be,what kind of leather (skiver or hide) and what style of border they would like. 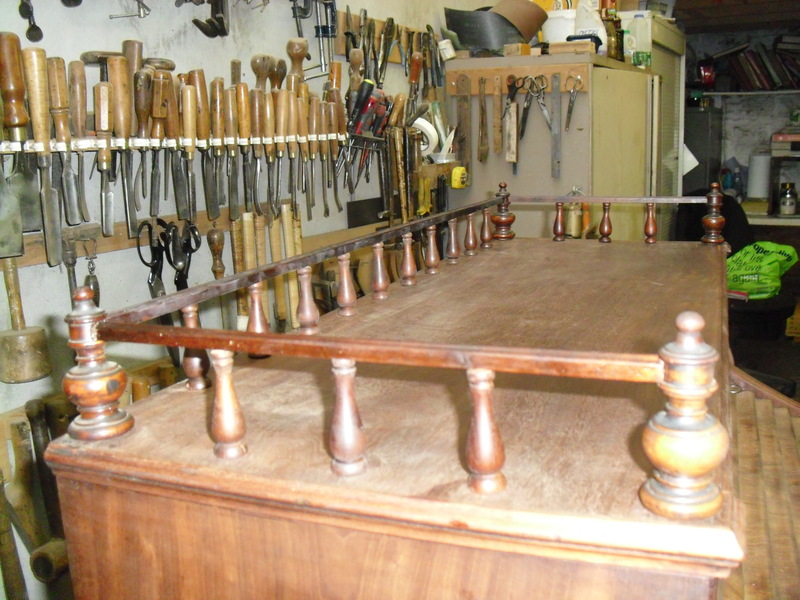 As you can see from the picture below it was missing its spindles and rails from the gallery. 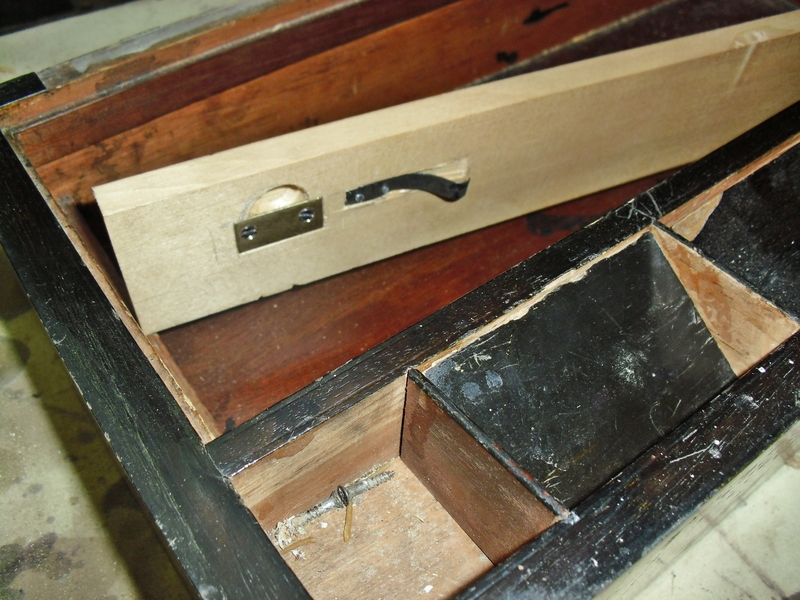 The handles were removed as they were added at a later date, these pieces didn’t usually have handles fitted and relied on keys to open and close them, which is why they often got damaged around the key holes. 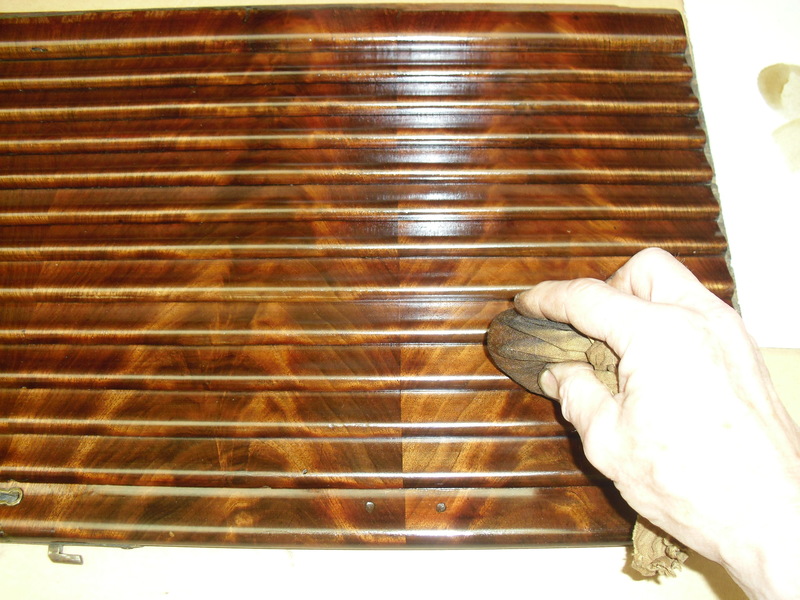 As you can see from this picture, the bottom slat was broken in the middle and had come apart from the rest of the tambour necessitating relining. 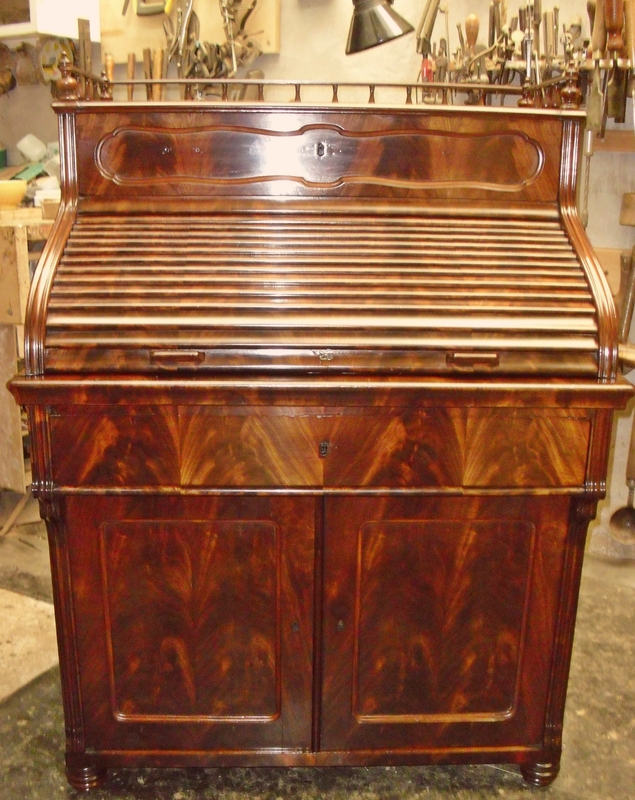 The back panel was removed and the tambour released. 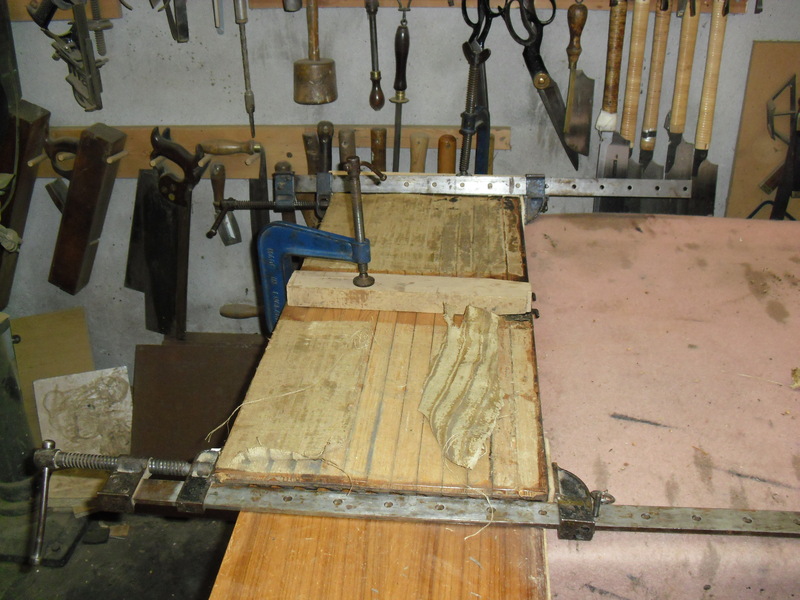 It was then cramped to a flat board on the bench to keep the slats square and prevent them from springing. 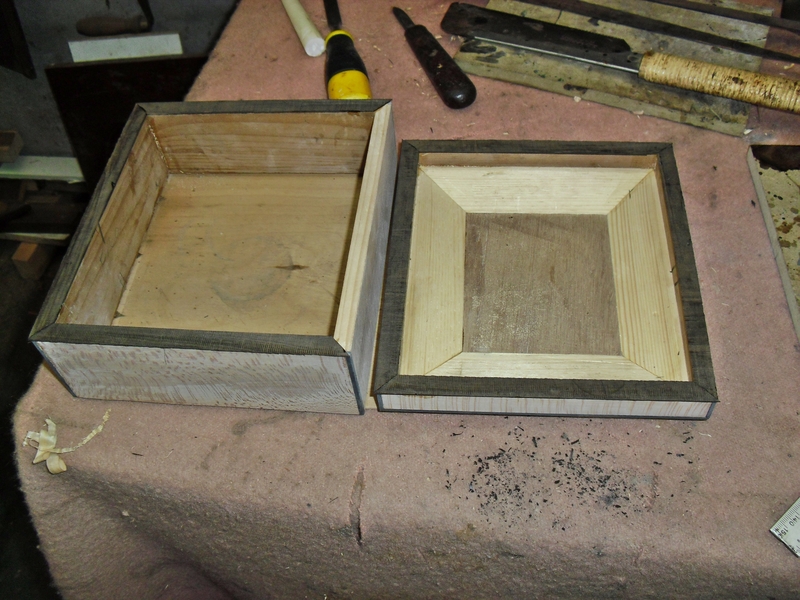 The old canvas was removed and the surface sanded. New calico was glued in place. After 24 hours the canvas was trimmed at the edges. This chair was brought into my workshop with a broken leg which had been badly repaired in the past using iron brackets. The leg was moulded on the two face sides. 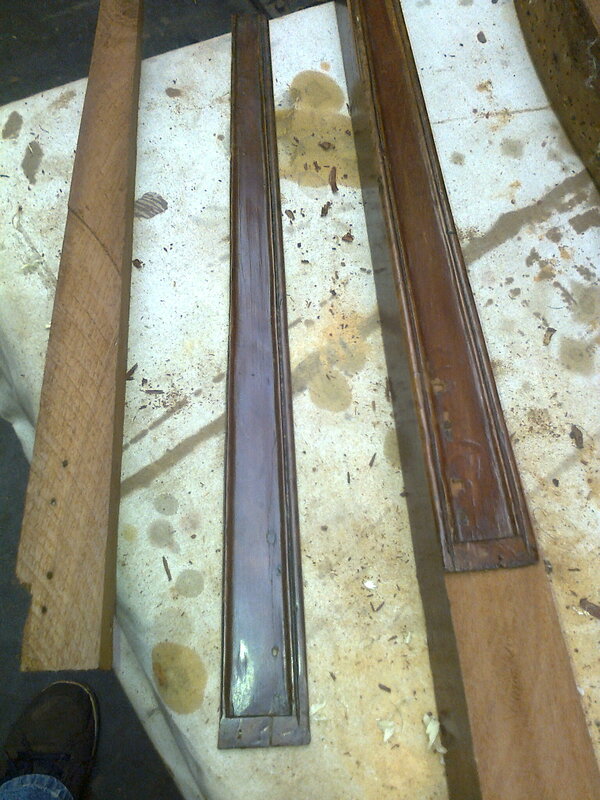 Rather than use new mahogany on this project I decided to conserve as much of the original chair as possible. 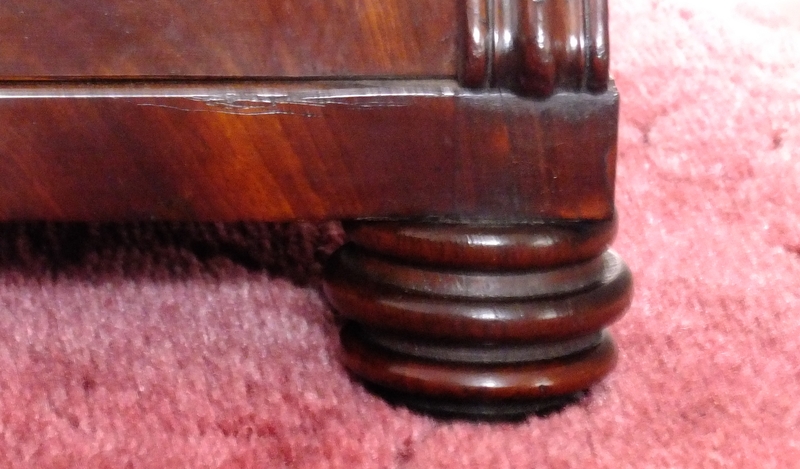 Cutting the moulding off the damaged leg as a veneer, I then trimmed an old mahogany table leg down to size and applied the moulded face sides, giving me a leg that matched the original retaining both the mouldings and patination. 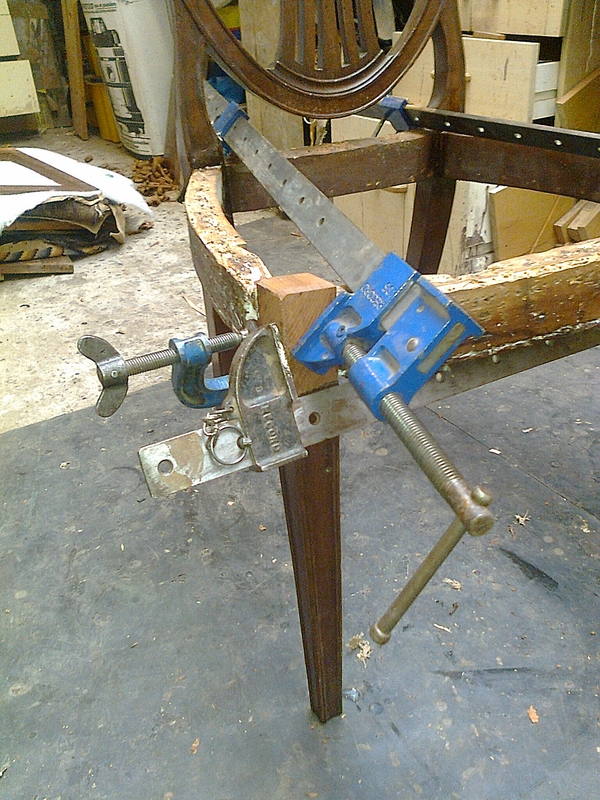 I re-cut the mortices, repaired the tenons on the frame and glued and cramped the frame together. 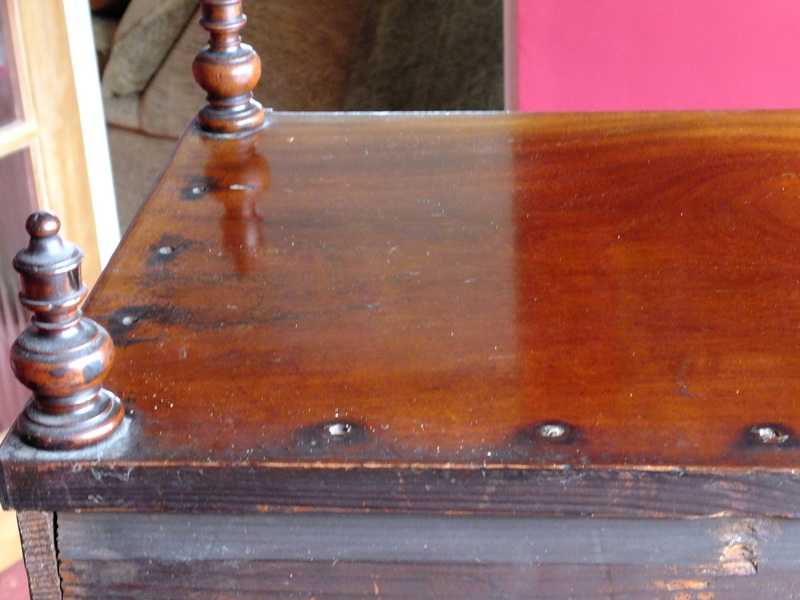 The previous bracket screw holes were filled, touched in and the chair was waxed finished. 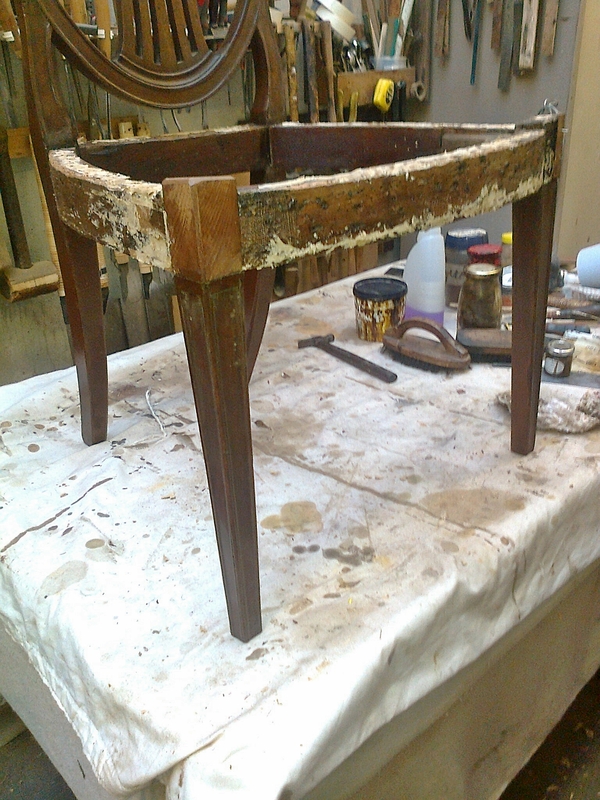 The finished article was a satisfying job conserving as much of the original look and patination of the chair as possible. 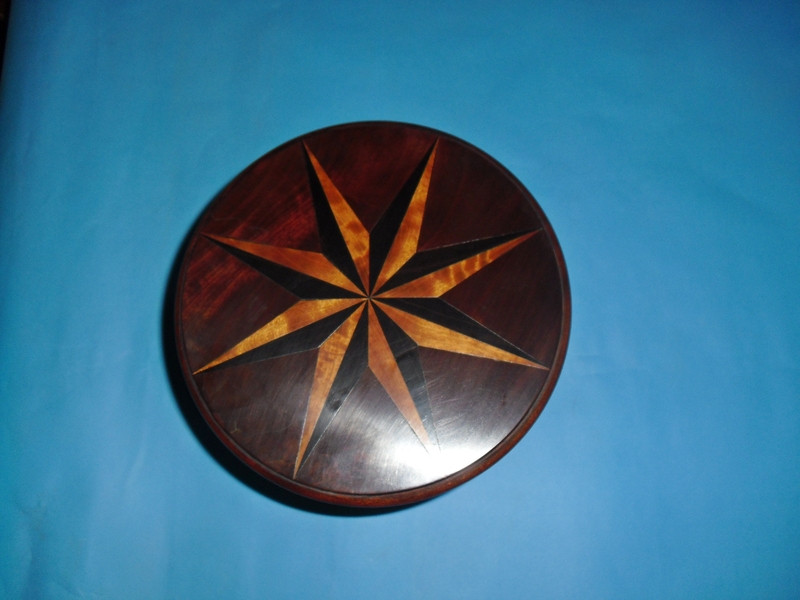 Having made a few pieces of antique miniature furniture, I then decided after restoring a William IV Cotton Reel holder, to make a copy of it for my wife. 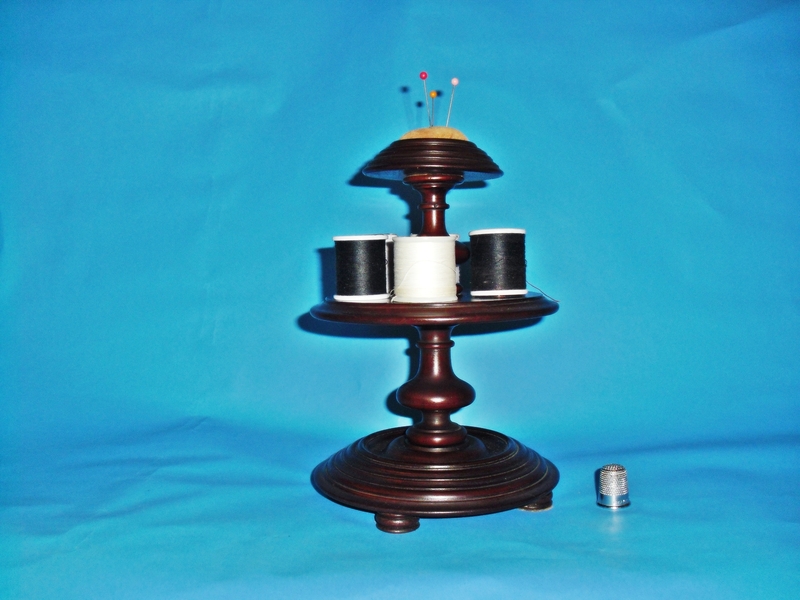 The cotton reel holder sits on a shelf at home and has proved to be a very useful as well as decorative item. 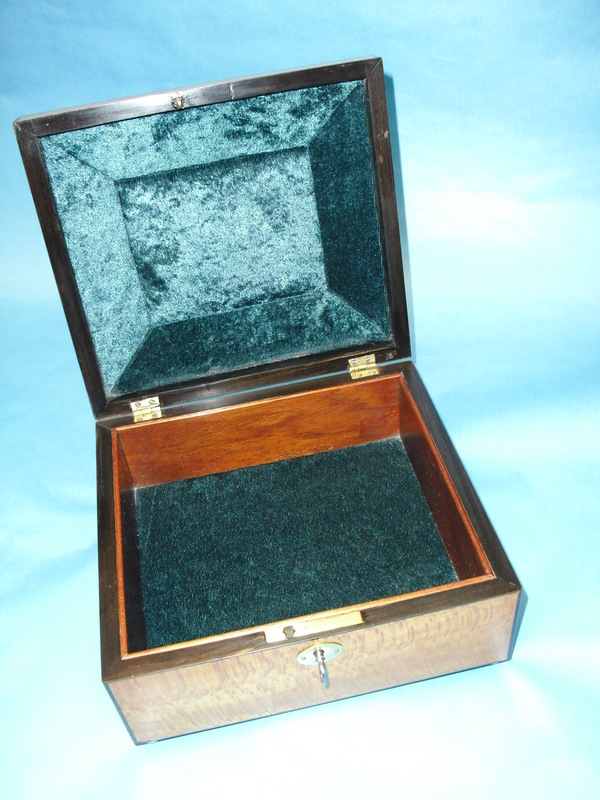 The top has a padded pin cushion. 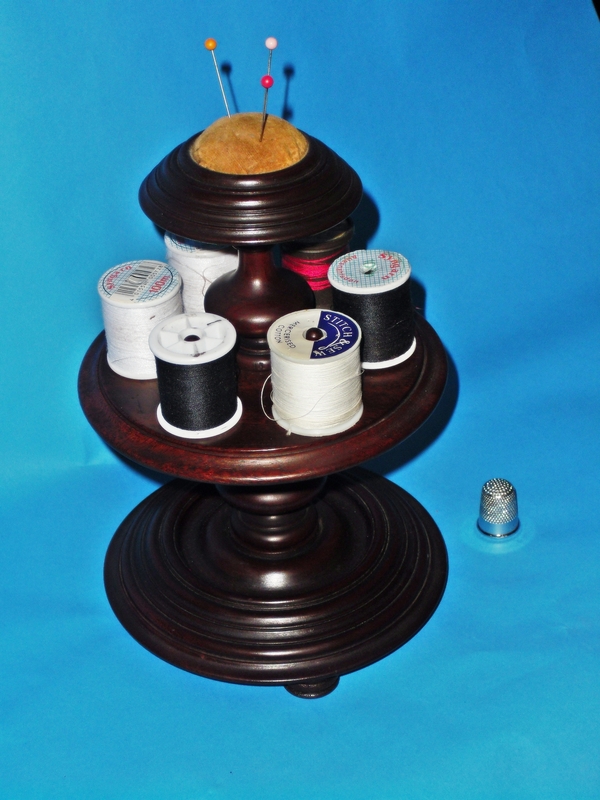 Made of reclaimed Cuban Mahogany, the holder has one revolving tier which holds 6 cotton reels . 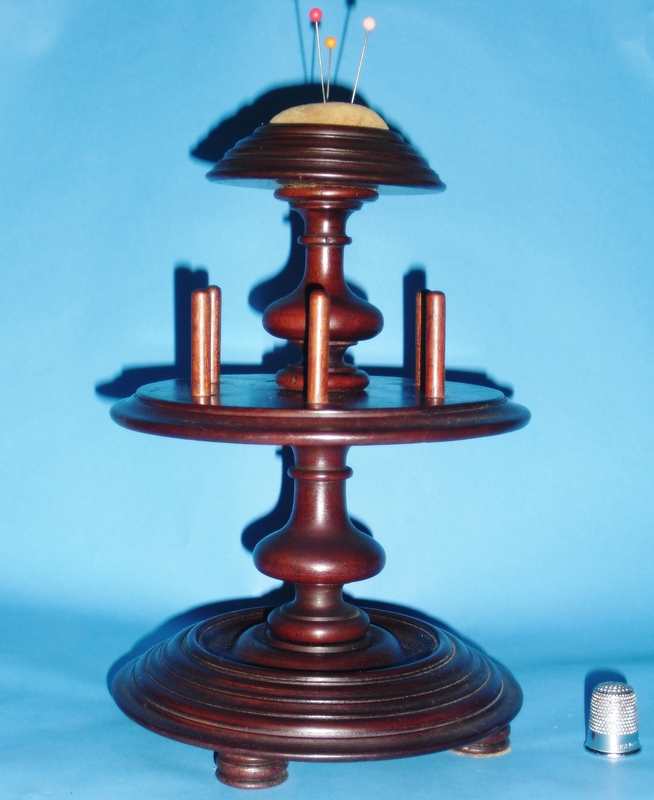 This is a copy I made of a miniature William lV Breakfast Table that came through the workshop. 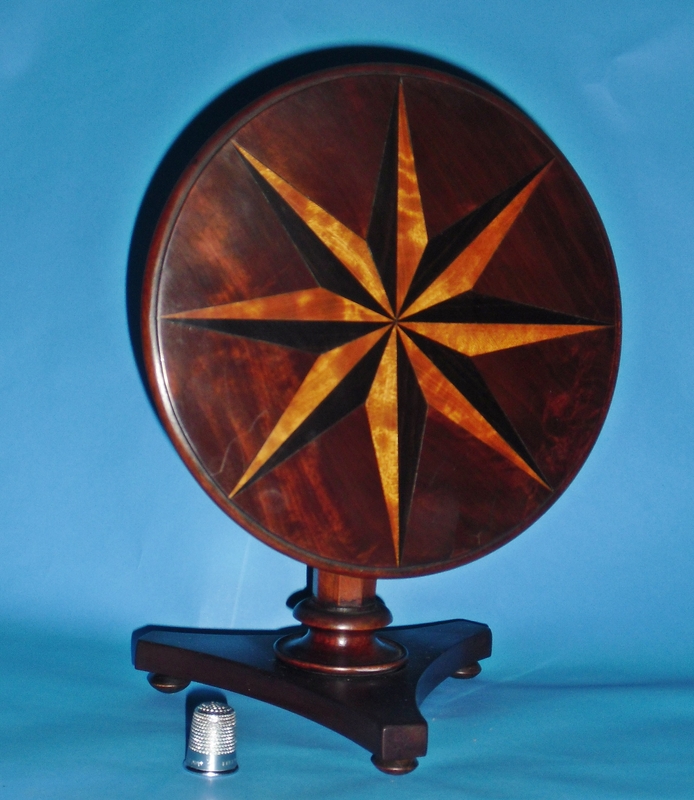 The top being Mahogany veneered and inlaid with an eight point marquetry star in ebony and satinwood. 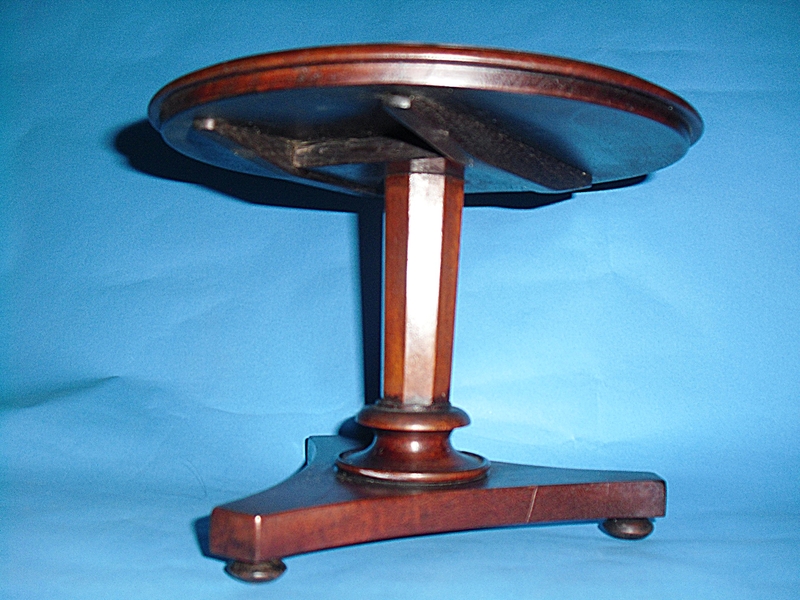 It has an octagonal tapered column on a platform base, terminating in bun feet. 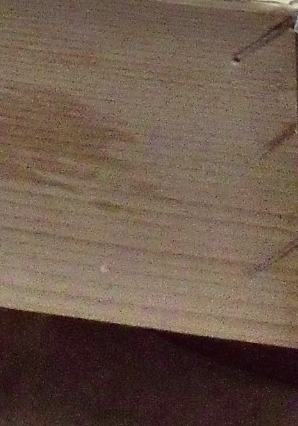 The table top in a tilted position. 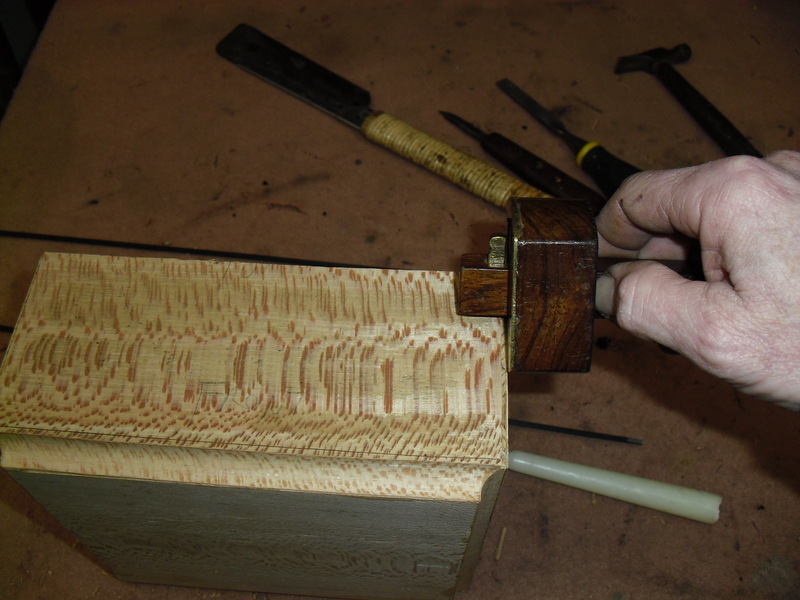 On a platform base, terminating in bun feet with an octagonal tapered column. 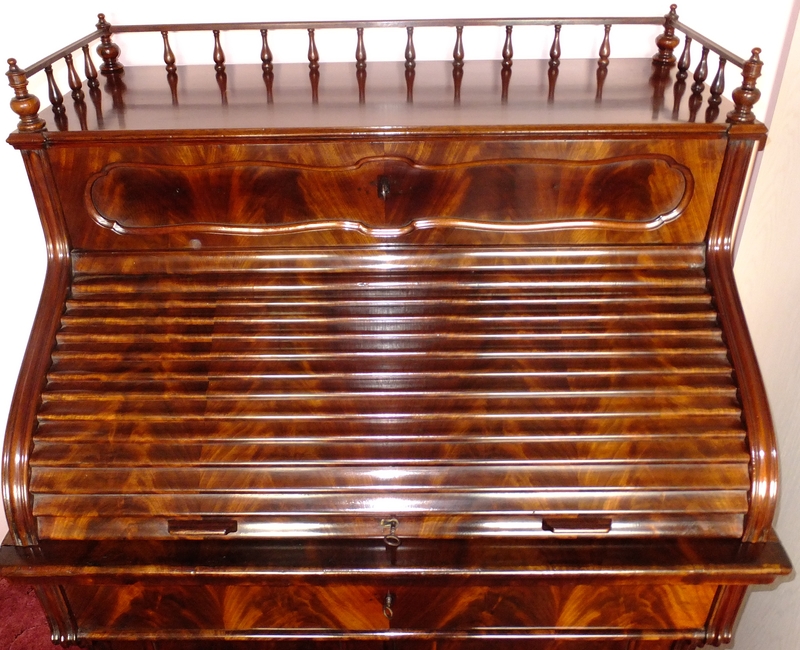 This Barnstaple based company manufactured some of the finest pieces of furniture in the Arts and Crafts style. 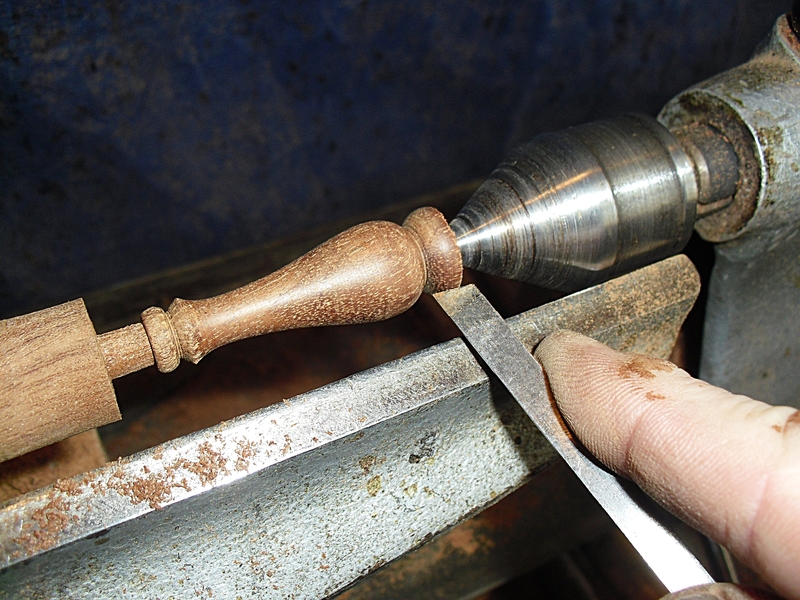 To make the missing spindles I glued together between newspaper, billets of mahogany the same diameter as the original spindles, this enabled me to separate them later in the process. 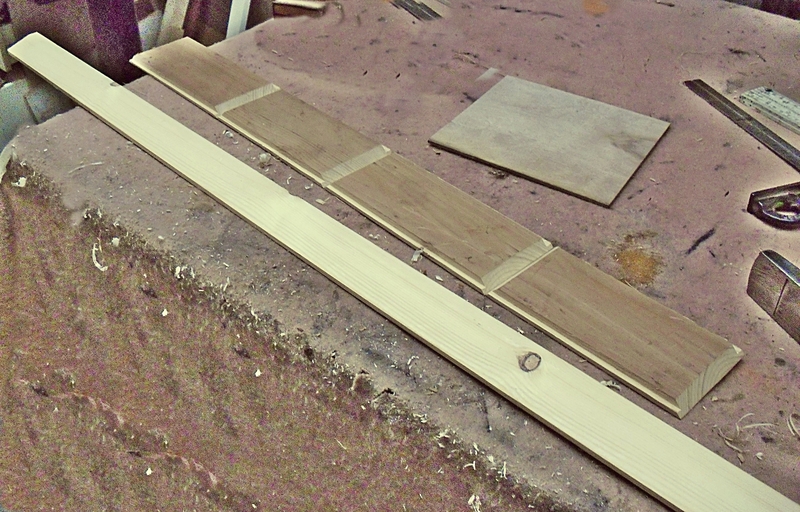 The profile was then planed and sanded on both sides. 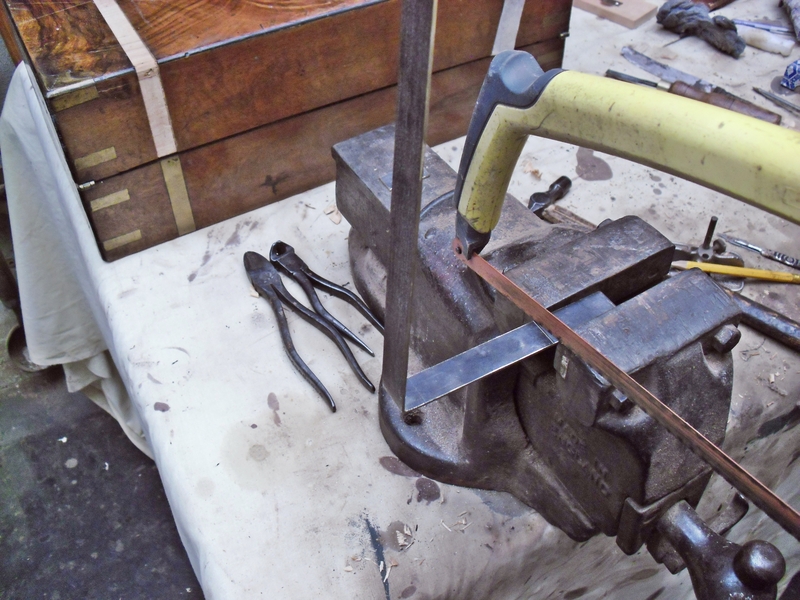 The billets were then separated and re-glued with newspaper between each one again and the process repeated. For the splashback, corner brackets and moulding I used a piece of reclaimed timber that was already polished the same colour. The design for the pierced hearts I took from a similar item of Shapland and Petter furniture of the same period. 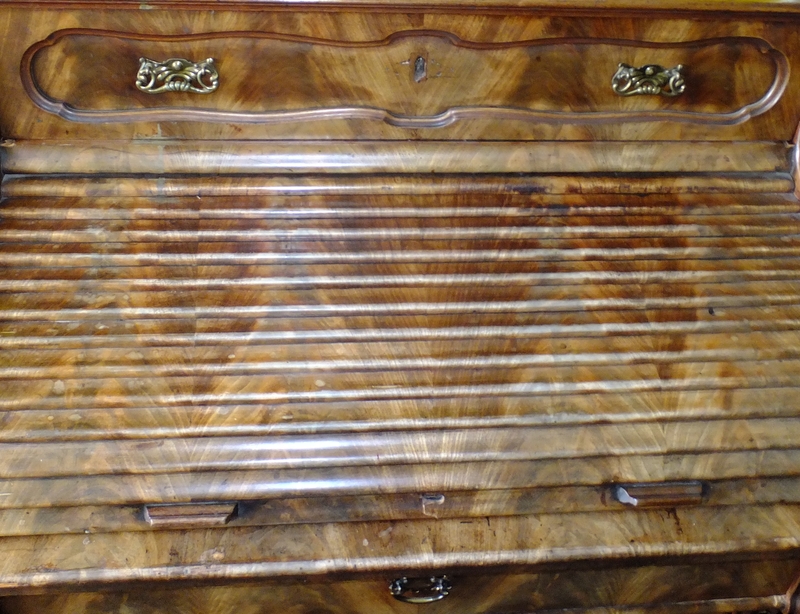 The top had water marks on it and was meths stripped and re-polished. 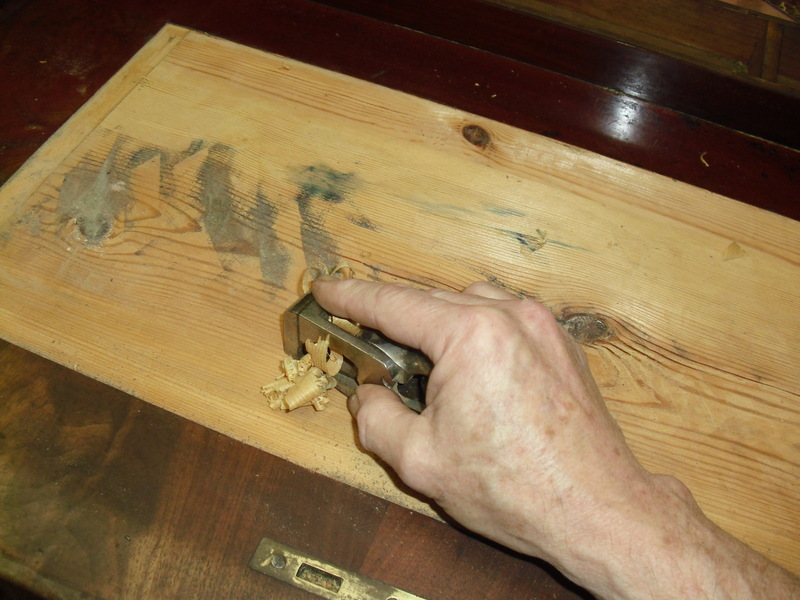 Any digs and scratches were filled, touched in and finally the whole piece was waxed. 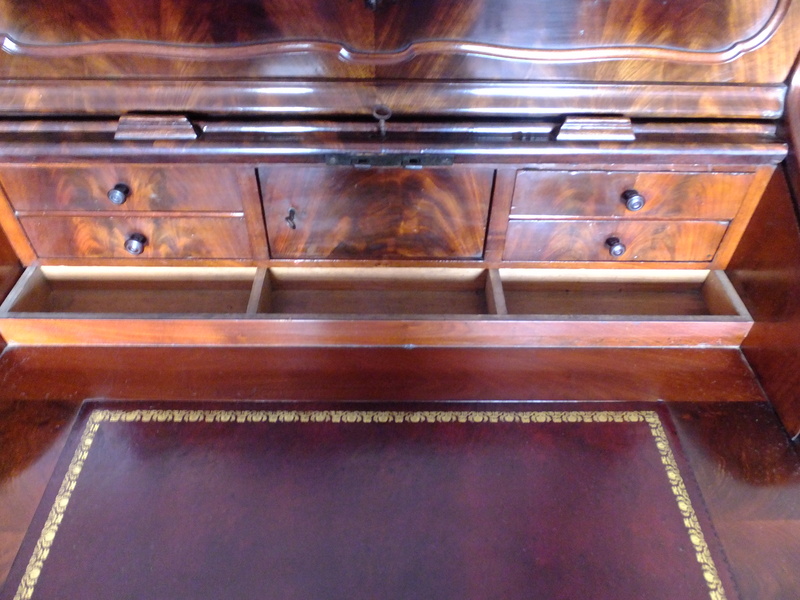 As you can see from the picture below, the interior of the desk retains the original deep red mahogany colour, whereas the exterior has been bleached extensively in direct sunlight. I tried using a polish reviver to bring back the colour with no success, so the next step was to meths strip the exterior. 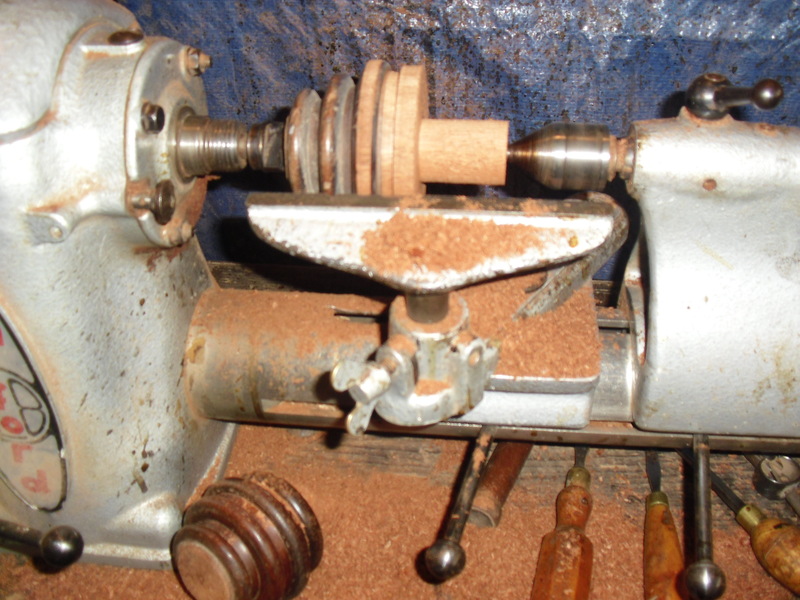 I used meths rather than a paint stripper as this still leaves the grain fairly full. 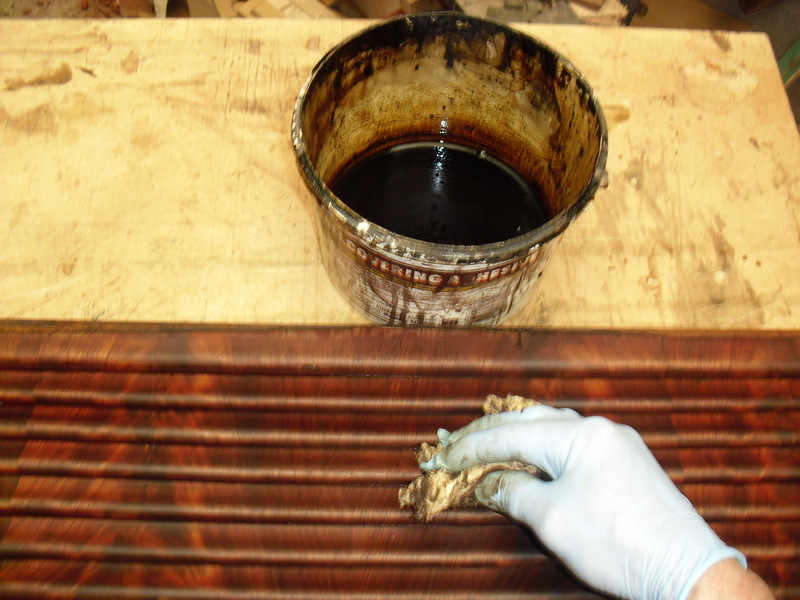 The next step was to mix up a water based stain to match the interior. 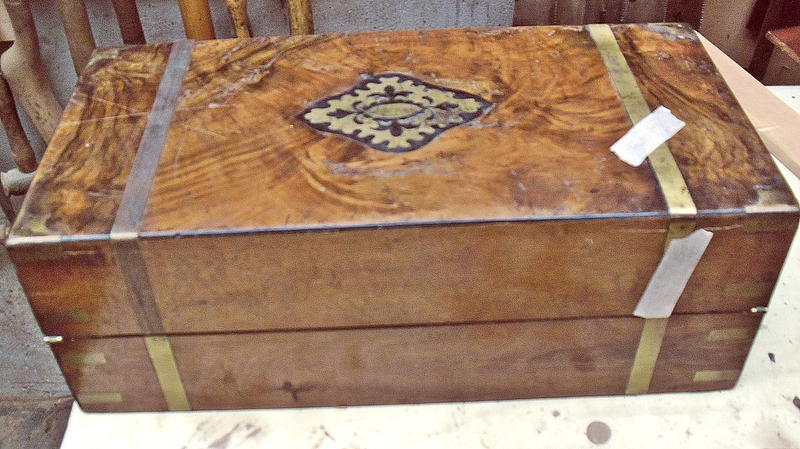 I applied the stain with a cloth following the direction of the grain, working quickly to avoid patches and streaking. After leaving to dry for 24 hours I commenced polishing. 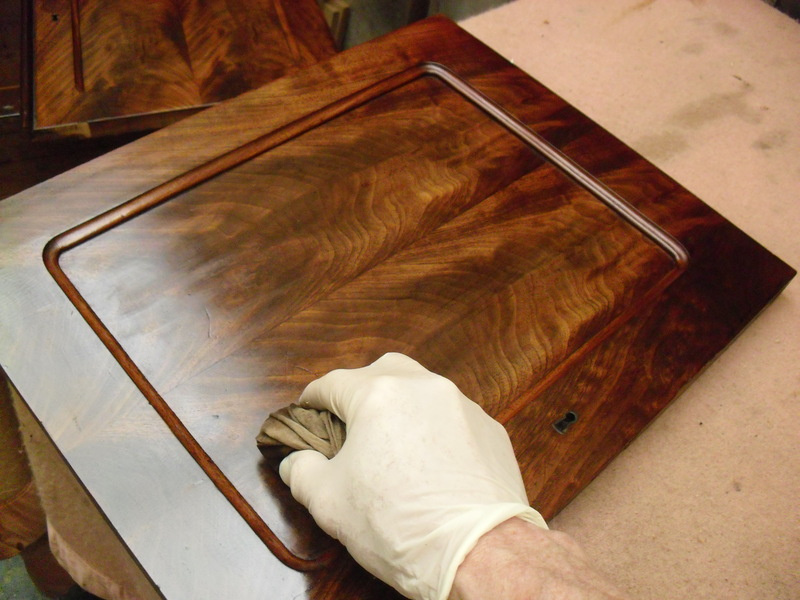 As you can see from the picture, a couple of coats of polish brings out the true beauty of the curl veneers. 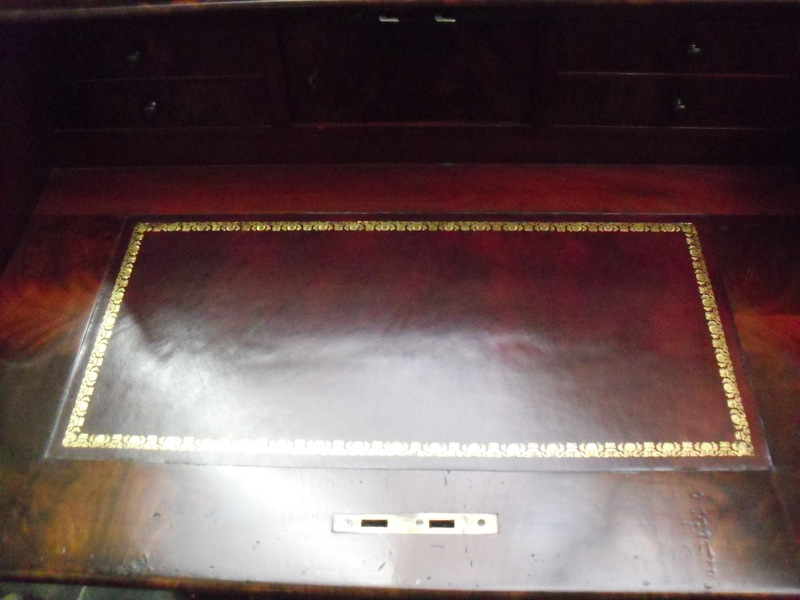 Originally a skiver had been fitted to the desk, after consultation with the client it was decided that we would fit a good quality hide in a plum colour with an antique finish and a gold border. 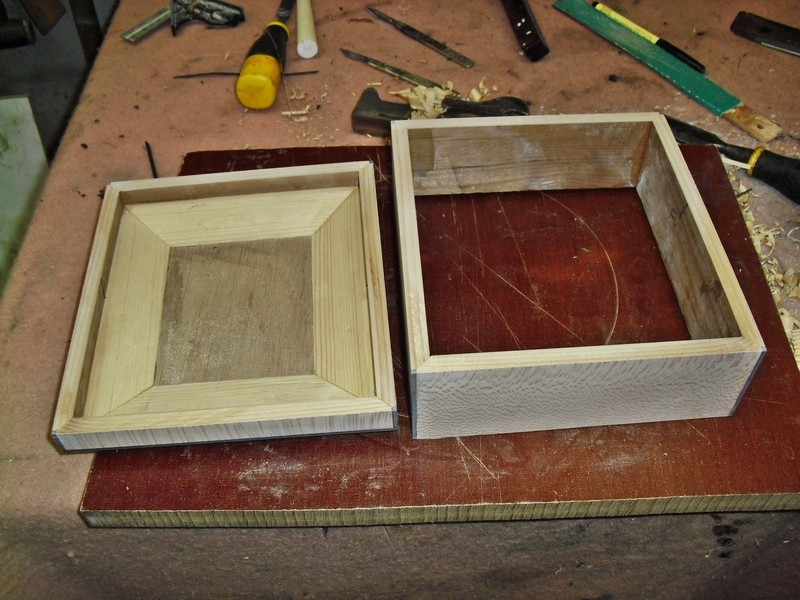 I then had to rebate the ground work out in order to fit the thicker hide. 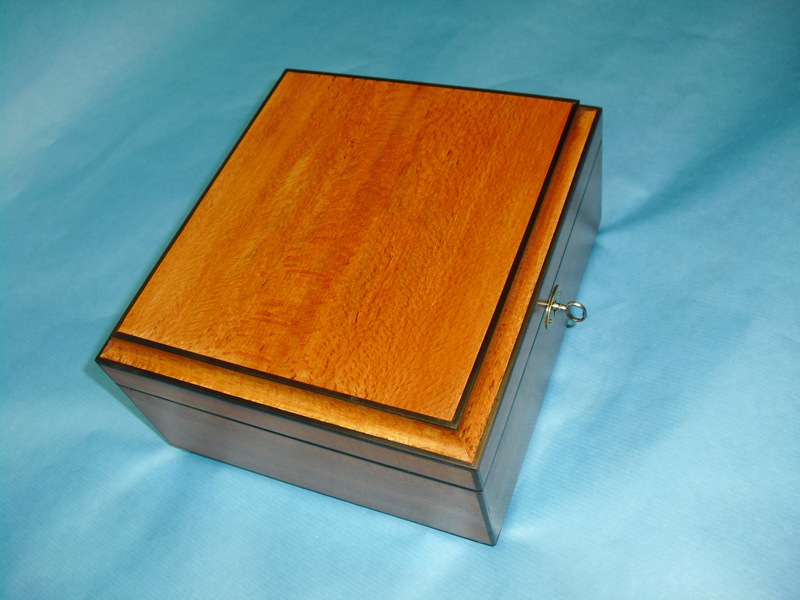 It was then sanded to a smooth finish as any imperfections would show through the leather. 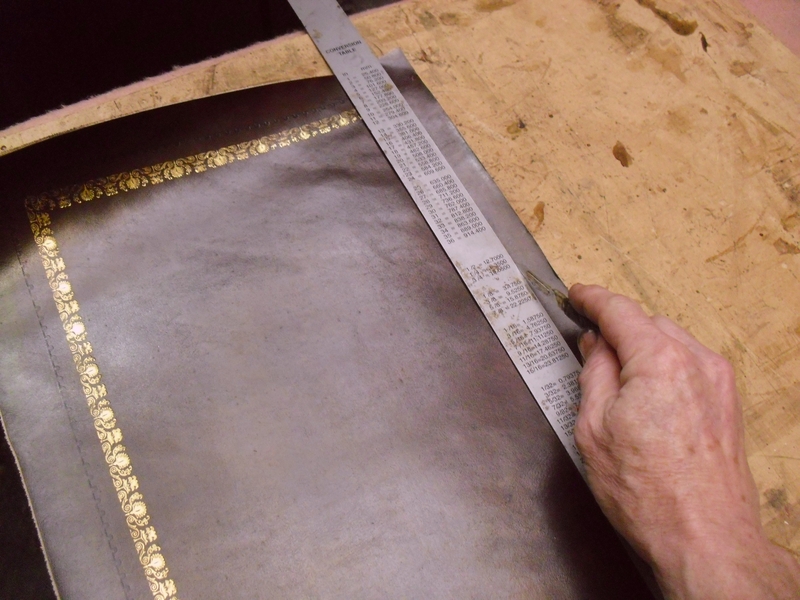 The leather was lined up and cut with a scalpel to fit and was then pasted using a lap paste. 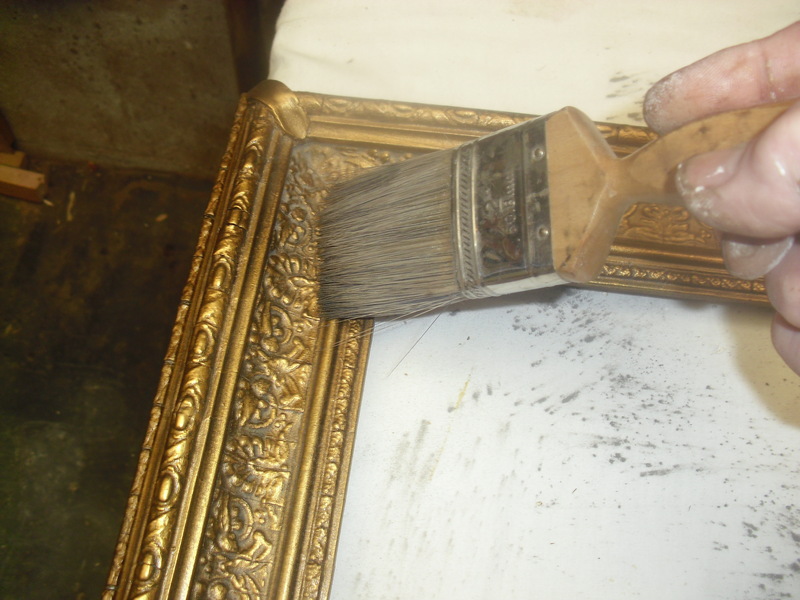 The air bubbles were removed using an ivory boning tool which has the same effect as a wallpapering brush, to ensure the leather goes down flat and smooth. 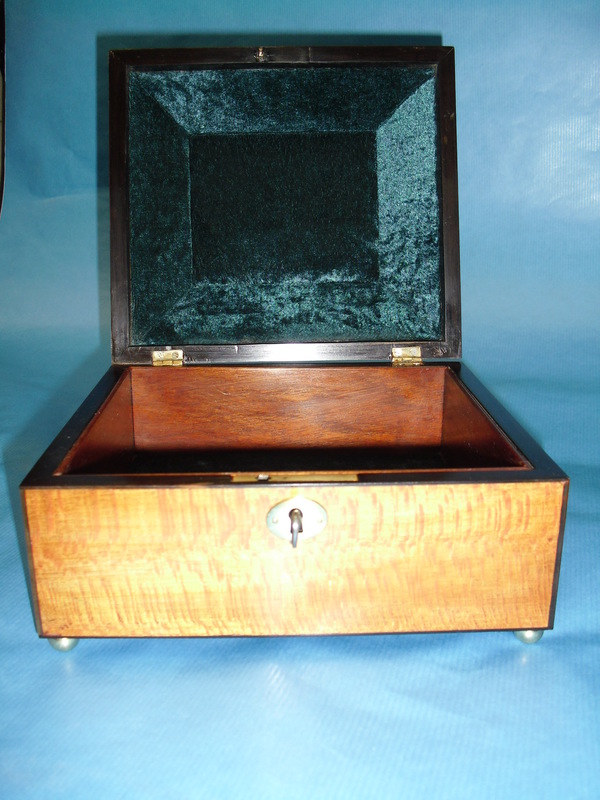 The client had owned this piece for some years and had been unaware of the fact that by pulling a spring under the slide, the slide came forward revealing three secret compartments. 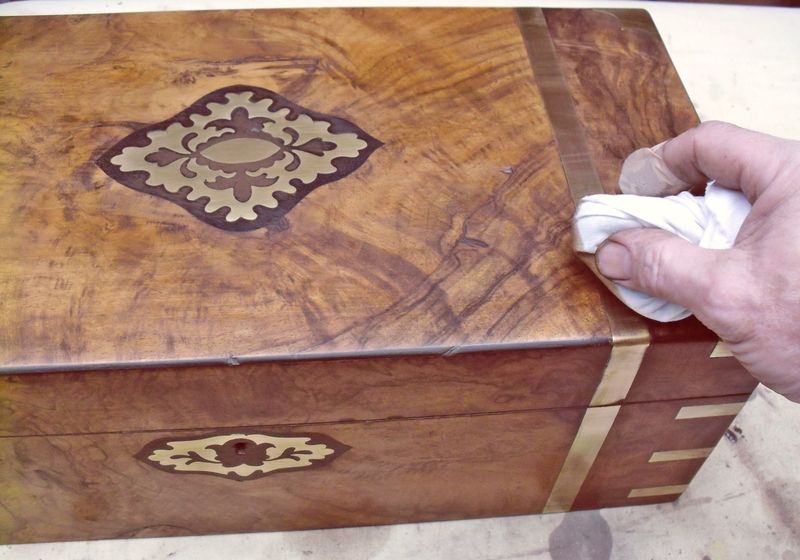 The whole piece was then waxed using finest quality beeswax and a lot of elbow grease. 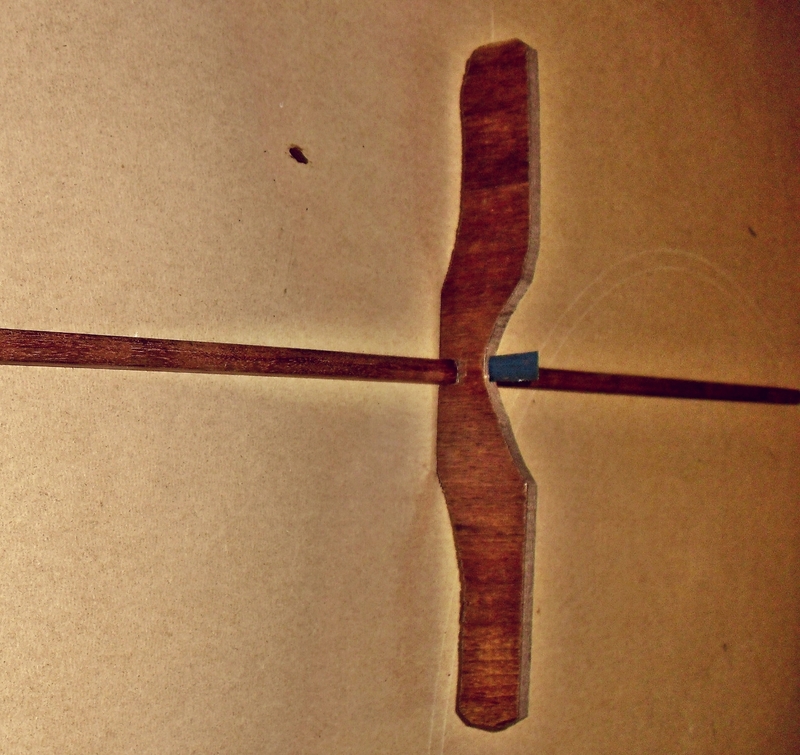 I made a simple scratch stock from a hacksaw blade and a piece of scrap timber. 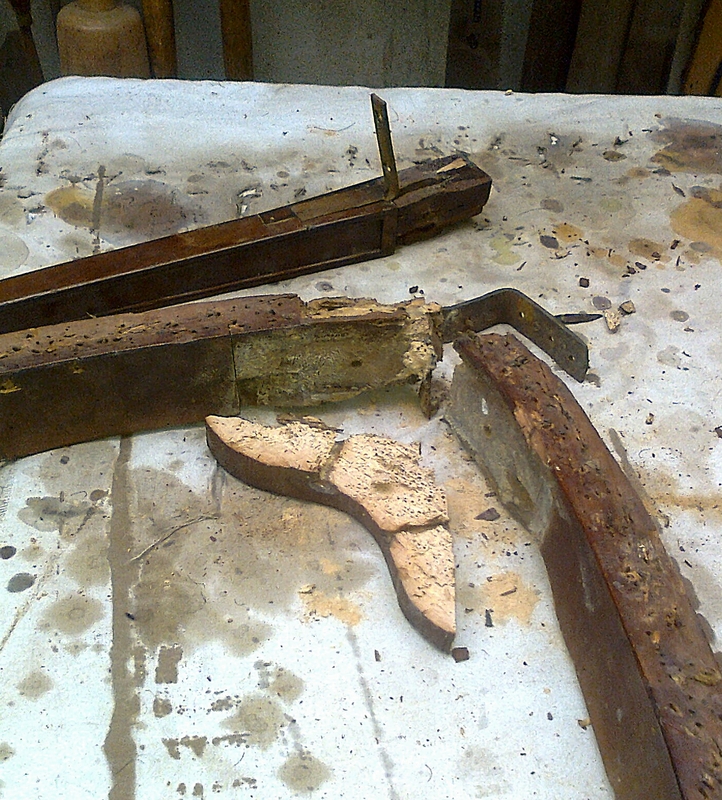 The hacksaw blade was ground to the profile I required. 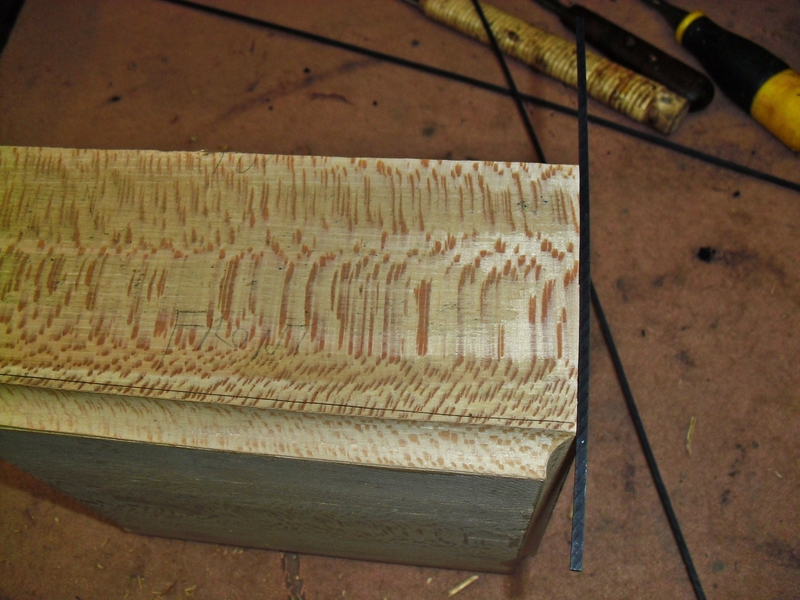 I then draw it up and down the length of the rail to scrape the profile out on both sides. 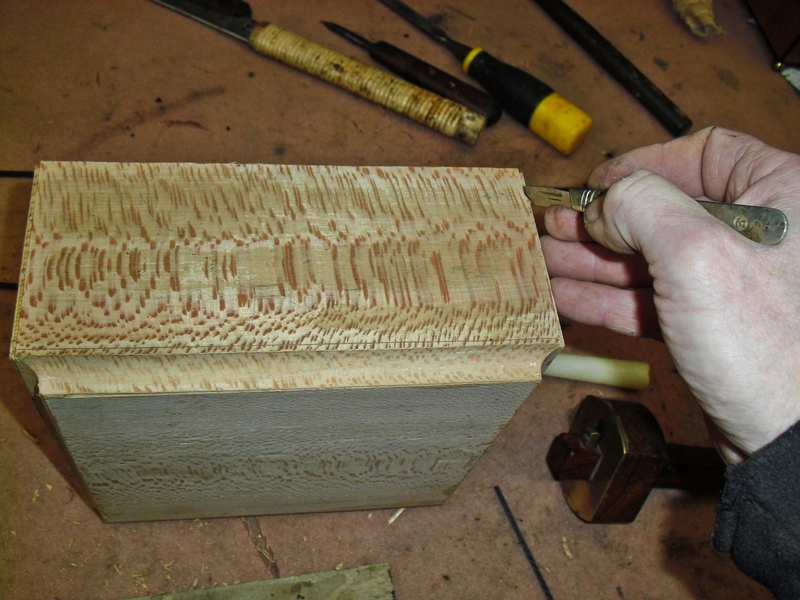 This could have been done with a router but I find this method far quicker on short lengths of timber. 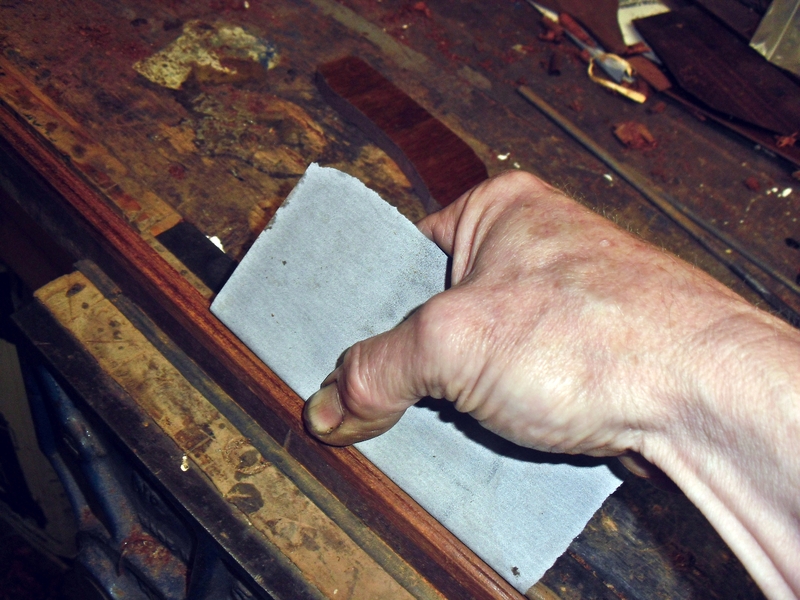 The rail was then papered with 180/240 grit, dampened with a cloth to raise the grain and repapered using 240 grit. The rails were tenoned into the four corner posts. 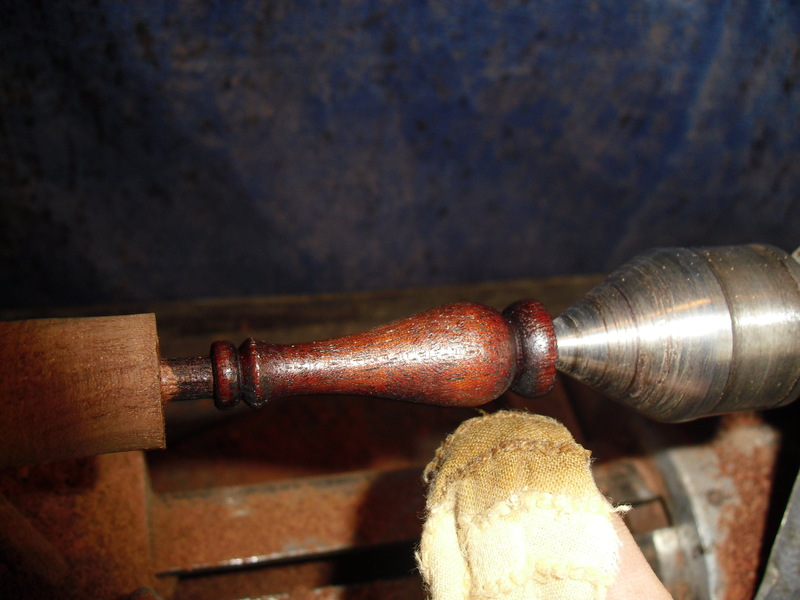 When turning the spindles, I stained and friction polished them on the lathe to save time later, again I dampened to raise the grain and repapered. 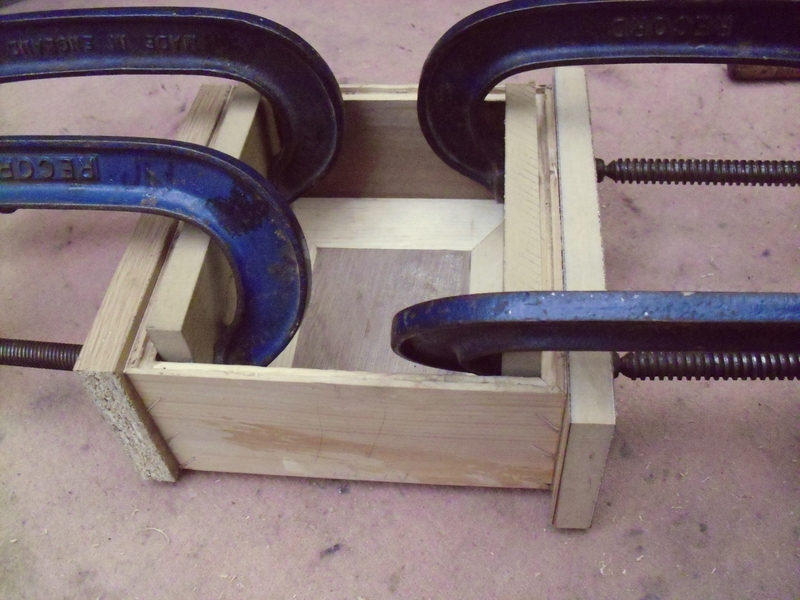 These were turned using some reclaimed feet. 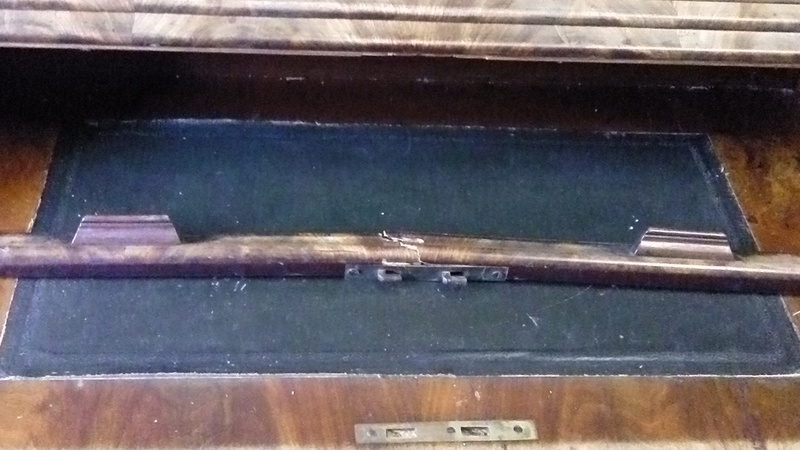 They were turned in the same style, but the size was reduced. 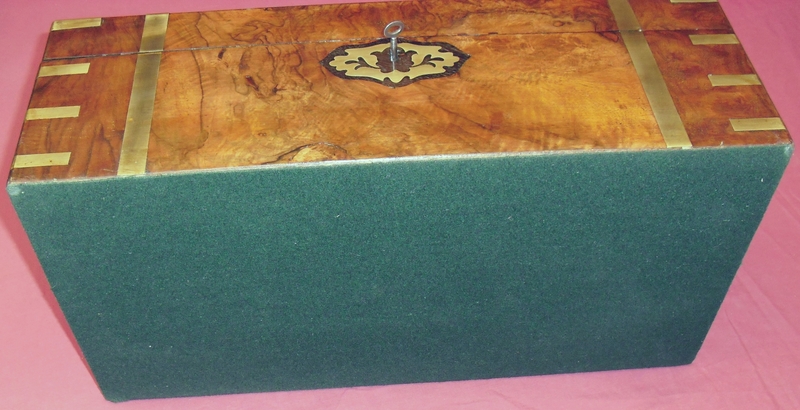 Several years ago I was asked to make a trophy for my local Angling Club of which I am a member. 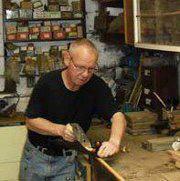 I was recently asked to repair the fish as some of the fins had broken off over the years.